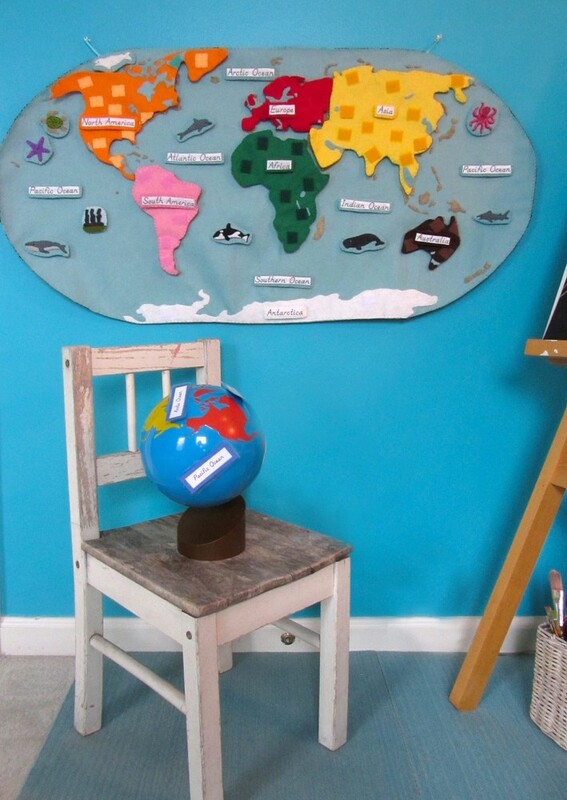 If you haven’t been introduced to our Montessori wall map and quiet book yet, you can read all about it here. 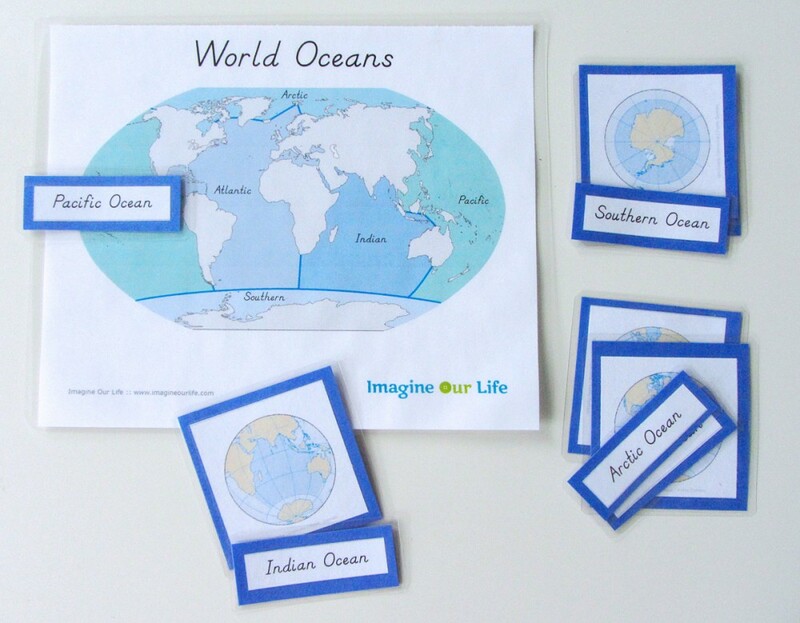 This post isn’t actually for a continent… It’s for the oceans! 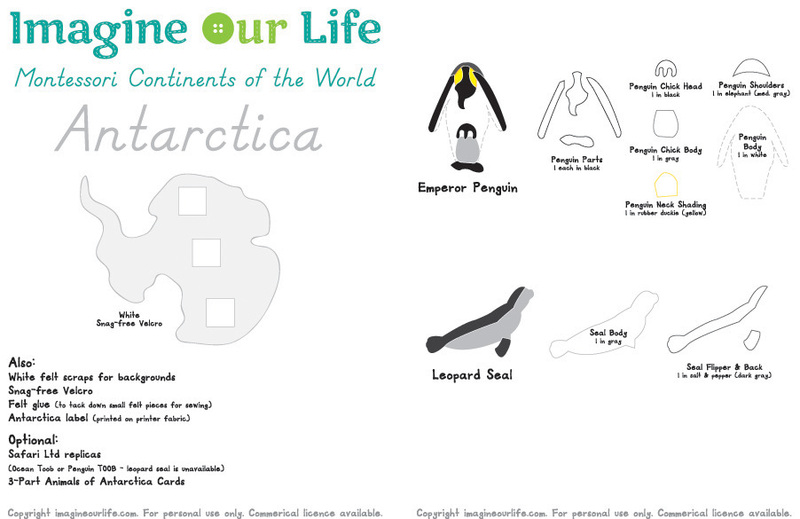 Every continent (and the oceans) will have landmarks and animals. 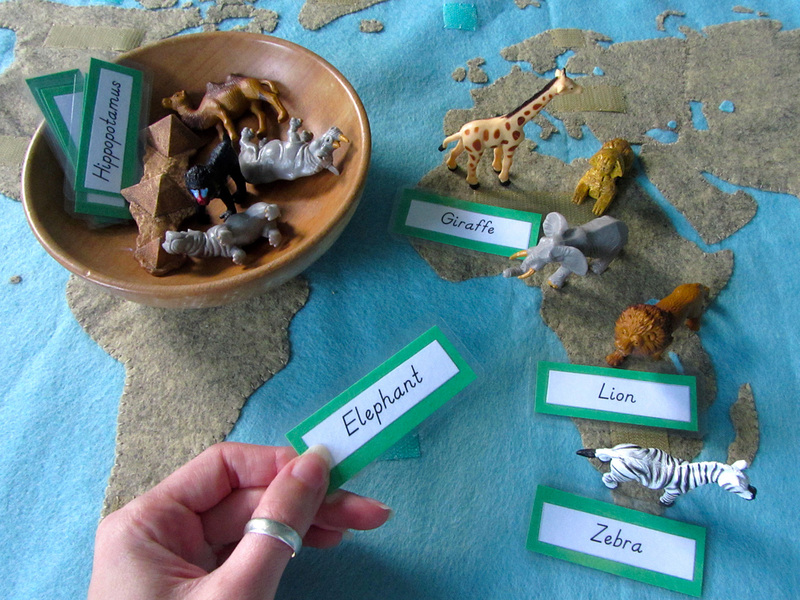 Some, like Europe, have more landmarks than animals. 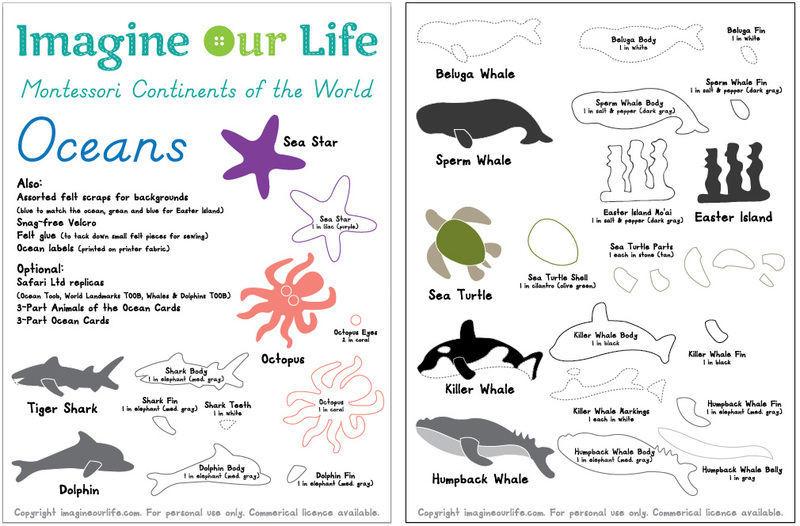 The oceans have a lot of labels, 9 animals and one island landmark. Those of you who follow along on Facebook or Instagram have been seeing my progress as I’ve worked on the ocean animals. I’m so exciting to be working on this project! This will be an amazing resource for Jax throughout his school years. 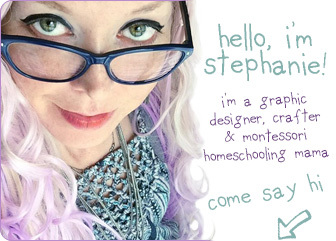 Yes, I am giving you all my patterns and printables for free! If you’d like to contribute, visit my support page. School items off of Jax’s Amazon wishlist always help! 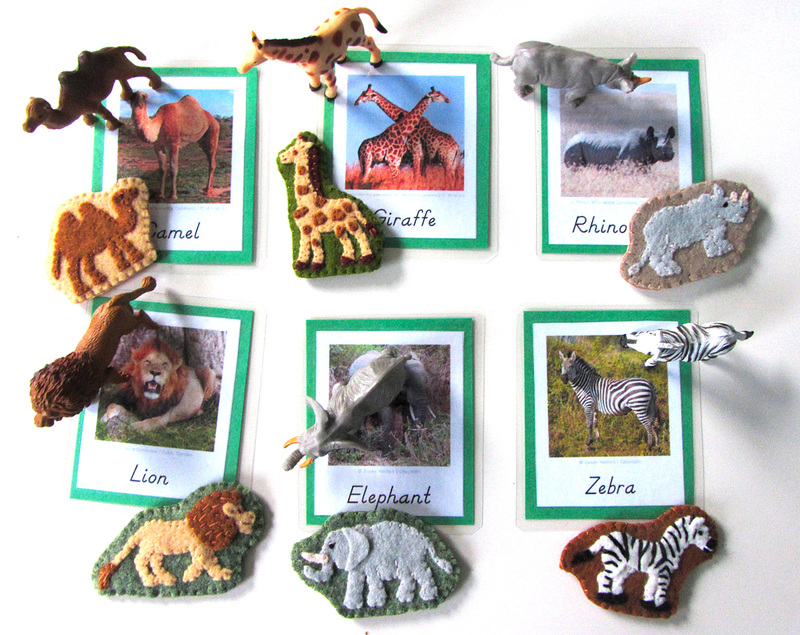 Felt from American Felt & Craft – lilac [purple], cilantro [green], stone [beige], pomegranate [pink], white, salt & pepper [dark gray], elephant [med gray], black and gray. From Benzie Design – swan [blue] for the water. Hook & Loop – I used white snag-free Velcro on the backs of all these pieces. 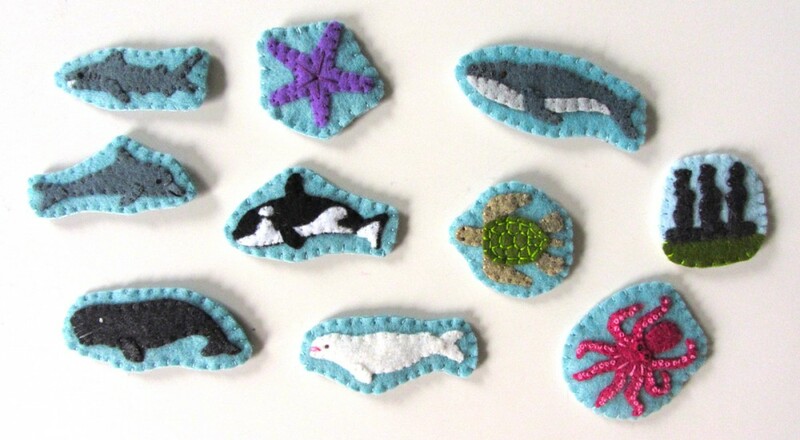 I used aqua blue hook where the animals attach to the ocean. 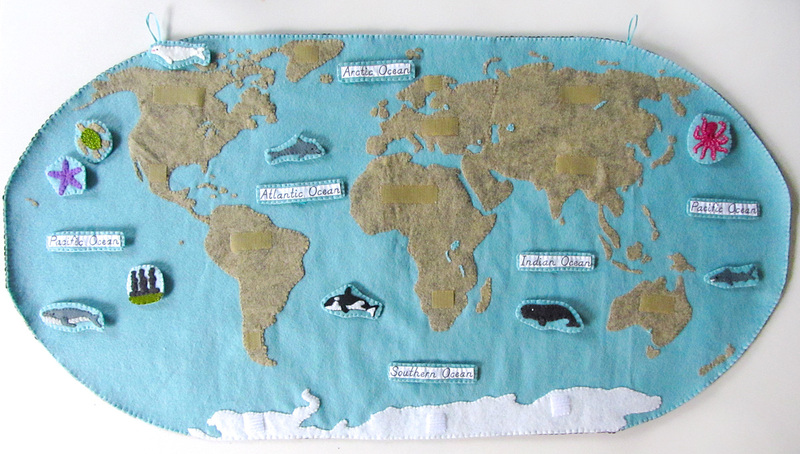 I updated this 8/6/13 to add one more ocean Velcro piece in the Pacific near Hawaii! 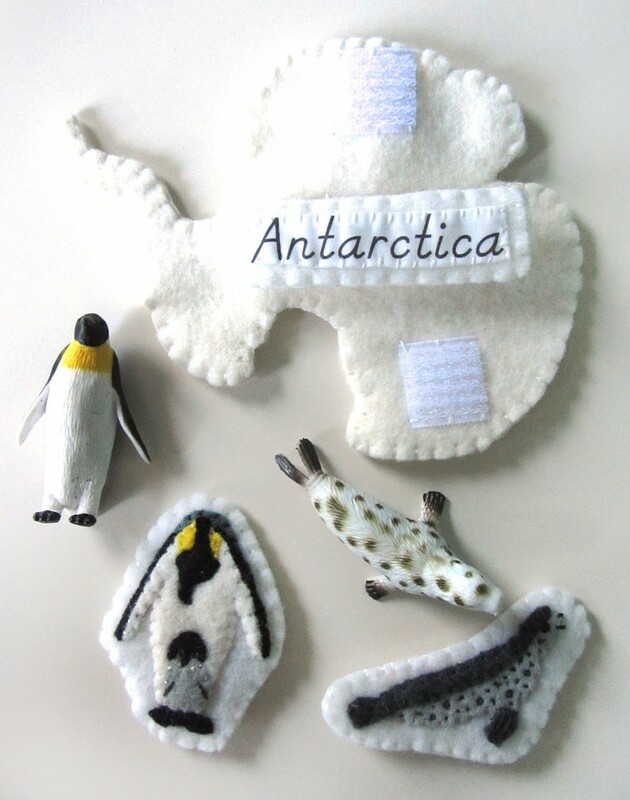 Other Things: Felt glue to tack down the pieces before sewing, printer fabric for the continent label, embroidery floss in colors to match the felt and micro tip scissors . Sea Star: (Felt used: lilac purple for the star and swan blue for the background) I glued down the sea star then sewed all around it. Using long straight stitches, I sewed a starburst in the center. 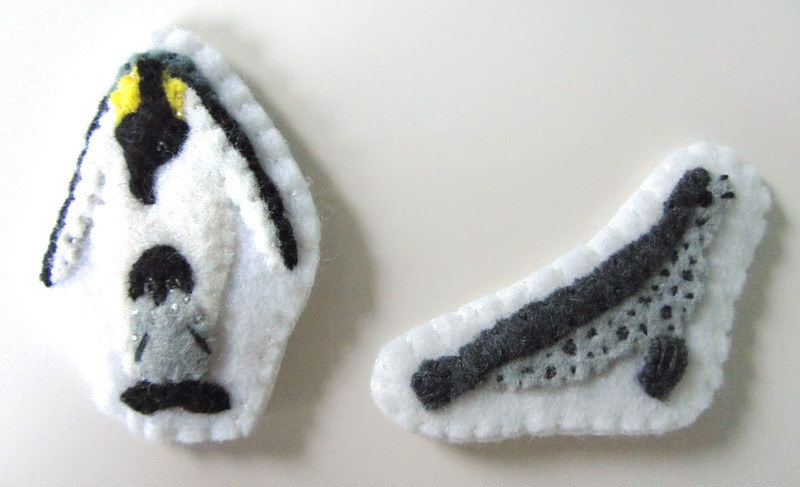 Killer Whale: (Felt used: black for the body, white for the markings and swan blue for the background) For the killer whale (orca), I glued the black body down first, then the white markings and the fin. 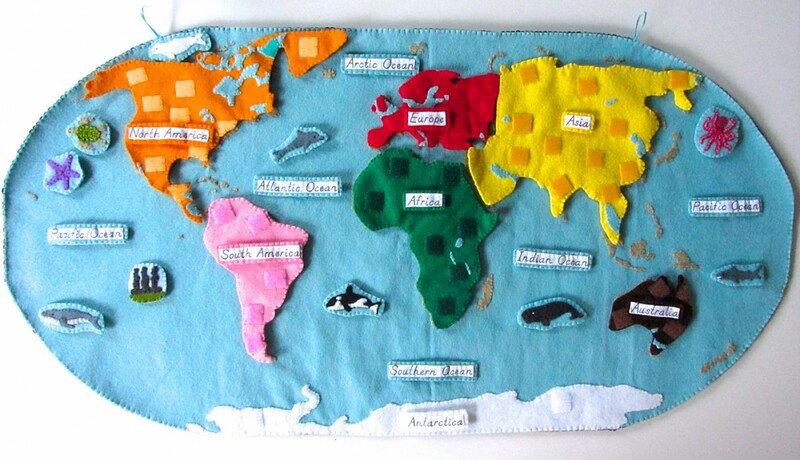 I stitched around all the edges. Sea Turtle: (Felt used: cilantro green for the shell, stone beige for the soft parts and swan blue for the background) For the sea turtle, I glued the soft parts of the turtle down, then glued the shell on top. 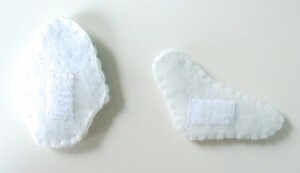 I sewed around the edges of the soft parts. On the shell, I used a lighter green thread and stitched all around the edge using longer stitches than I usually do. Then I used long stitches to make a shell pattern. 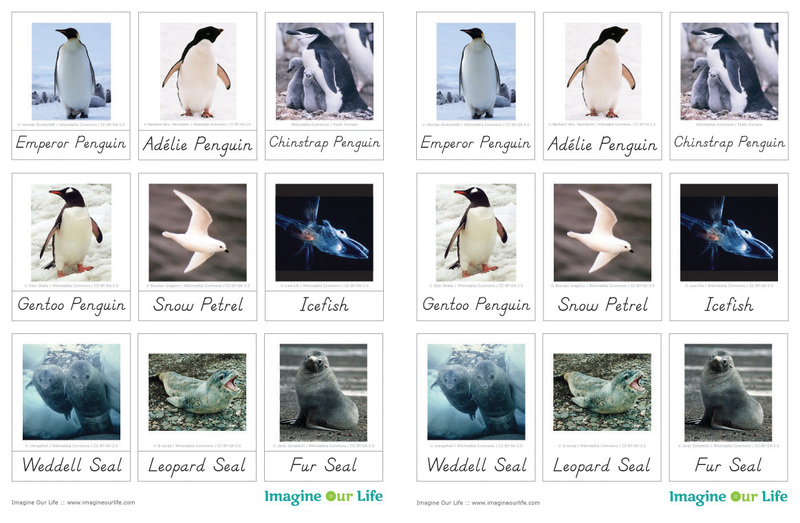 View the image full size to use as a guide. Tiger Shark: (Felt used: elephant med gray, white for the teeth and swan blue for the background) For the shark, I glued down the teeth first, then the body and fin. 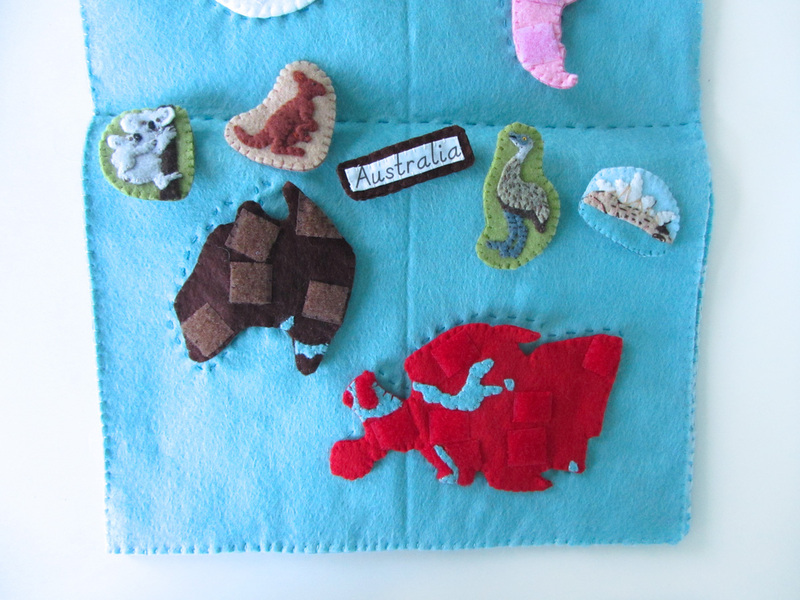 I sewed around all the edges, made some long, parallel stitches for gills and a French knot eye. I made some white zig zag stitches over his teeth. Sperm Whale: (Felt used: salt & pepper dark gray and swan blue for the background) For the sperm whale, I glued down the body and fin. 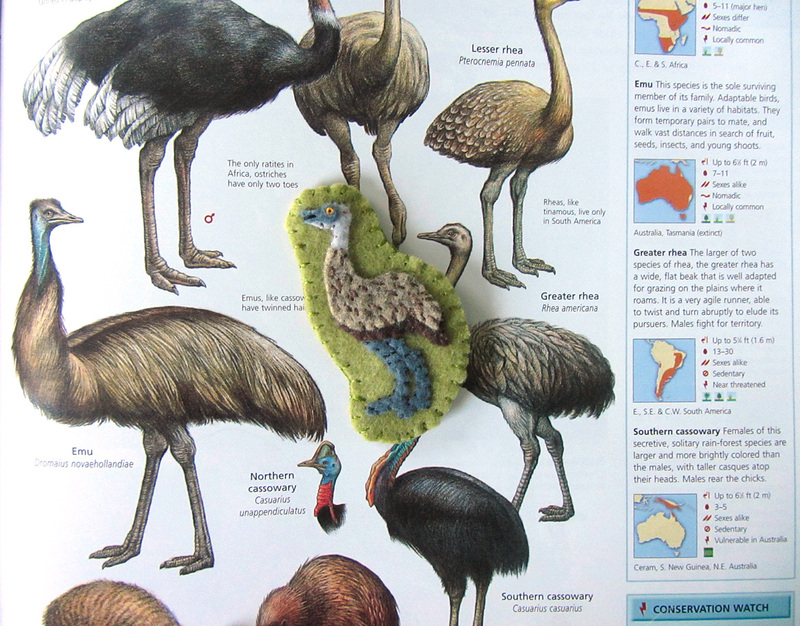 I sewed around all the edges, made a long stitch for his mouth and a French knot eye. Dolphin: (Felt used: elephant med gray and swan blue for the background) For the dolphin, I glued down the body and fin. 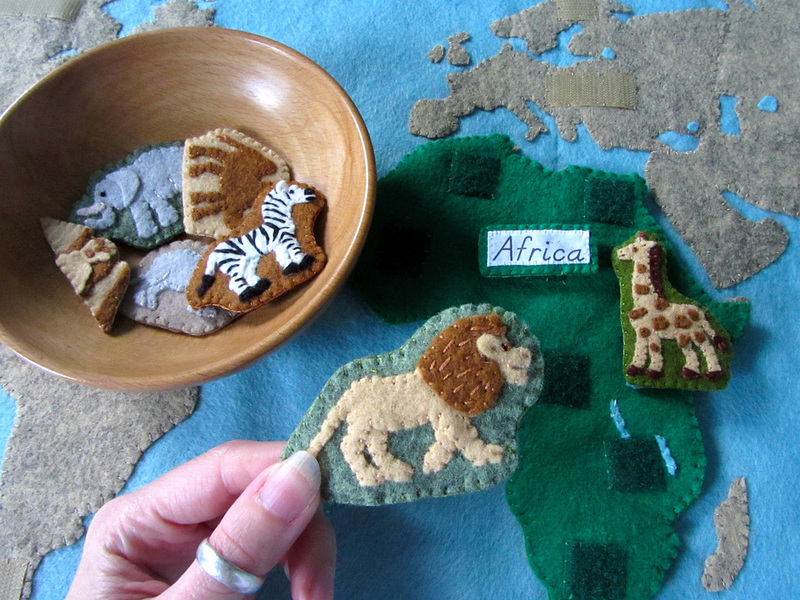 I sewed around all the edges, made a long stitch for her mouth and a French knot eye. 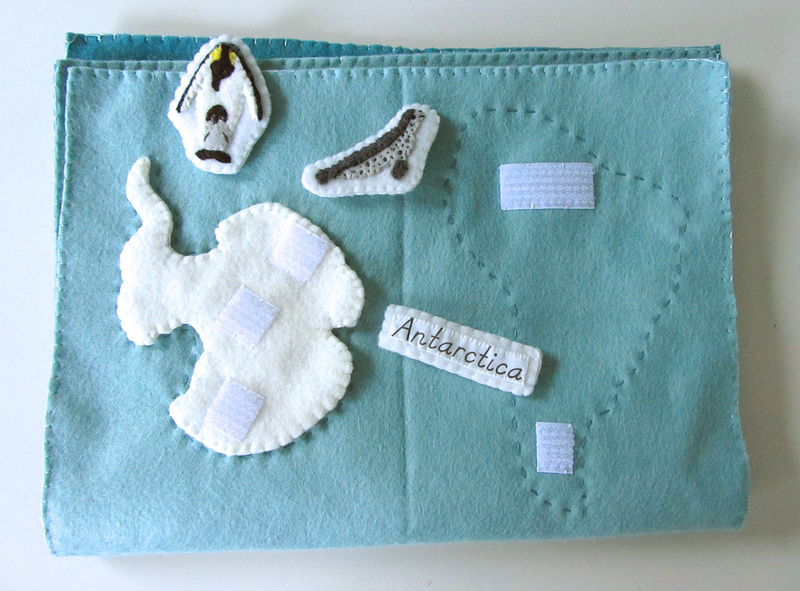 Beluga Whale: (Felt used: white for the body and swan blue for the background) For the beluga, I glued down the body and fin. I sewed around all the edges, made a few pink long stitch for her mouth and a French knot eye. Octopus: (Felt used: pomegranate pink for the body [but I’d recommend a coral or peach if you have it] and swan blue for the background) For the octopus, I glued down the body and eye bugles. I sewed around all the edges and made French knot eyes in black on the bulges.I made a few light pink long stitches in between the tentacles to show the webbing. 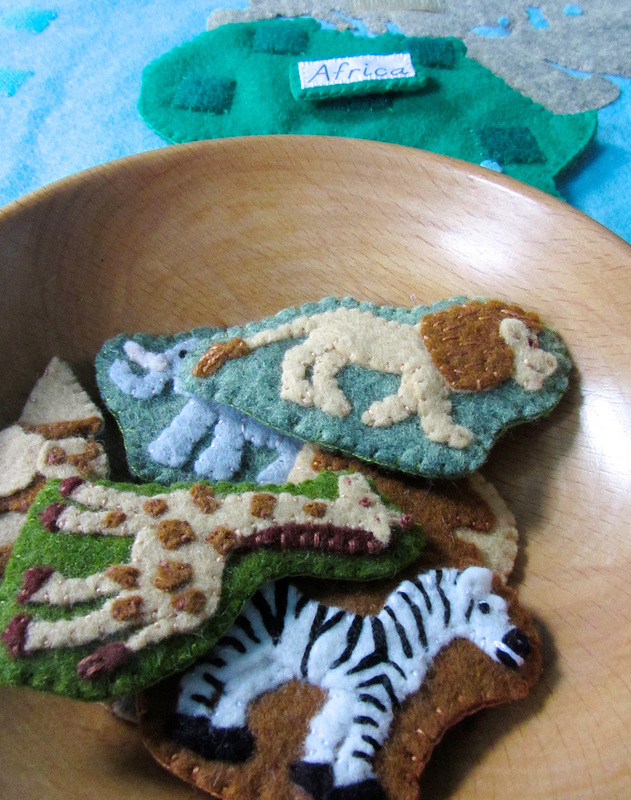 Then I made ten bazillion French knots! I used two strands of embroidery floss (of the 6 it comes with) and wrapped my needle twice for each knot. Humpback Whale: (Felt used: elephant med gray for the body, gray for the belly and swan blue for the background) For the Humpback whale, I glued down the body, belly and fin. 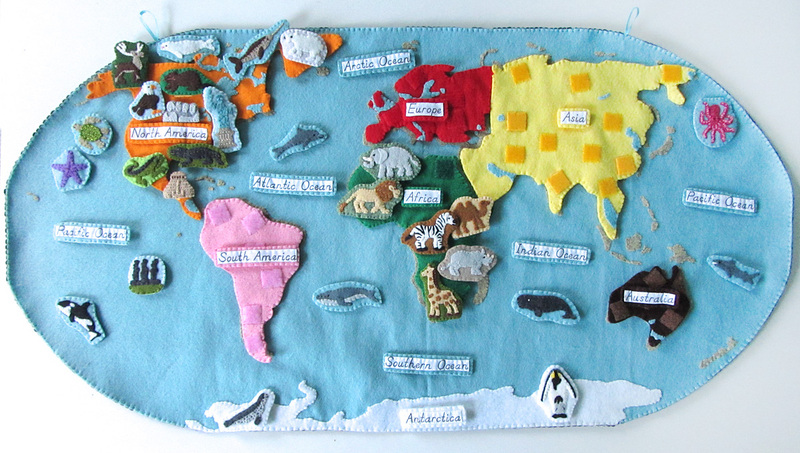 I sewed around all the edges and added a French knot eye. 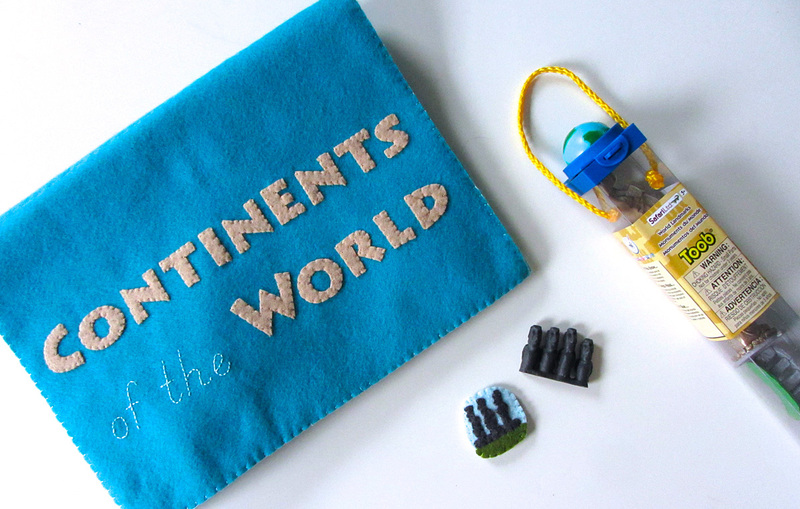 SafariLTD provided me with this beautiful World Landmarks TOOB. I am working with them to make this project as amazing as possible. All opinions of these products are honest and my own. 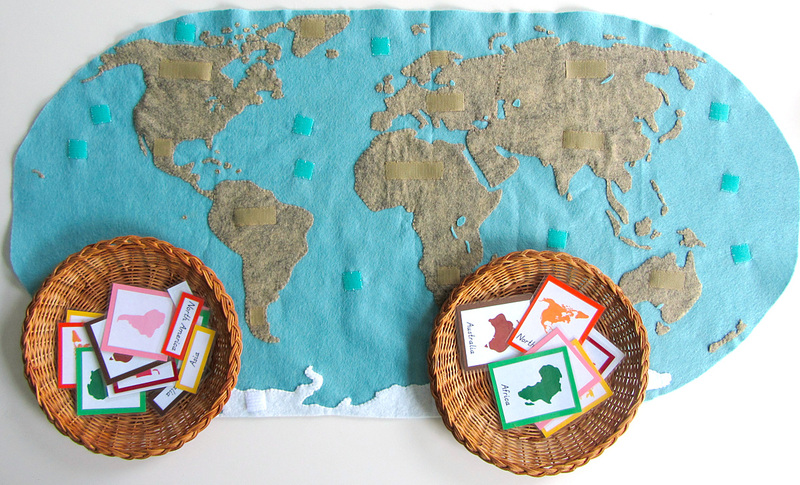 We are planning an exciting giveaway for you at the end of this project! I only did one landmark in the ocean set: the mo’ai statues on Easter Island. 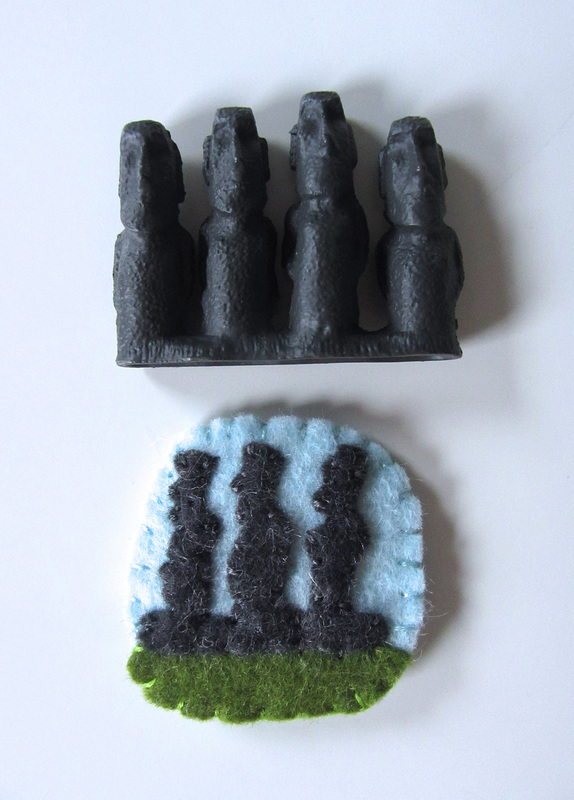 Easter Island: (Felt used: salt & pepper dark gray for the statues, cilantro green for the ground and sparrow blue for the background) I went very simple for this one and just glued and stitched the statues and background down. 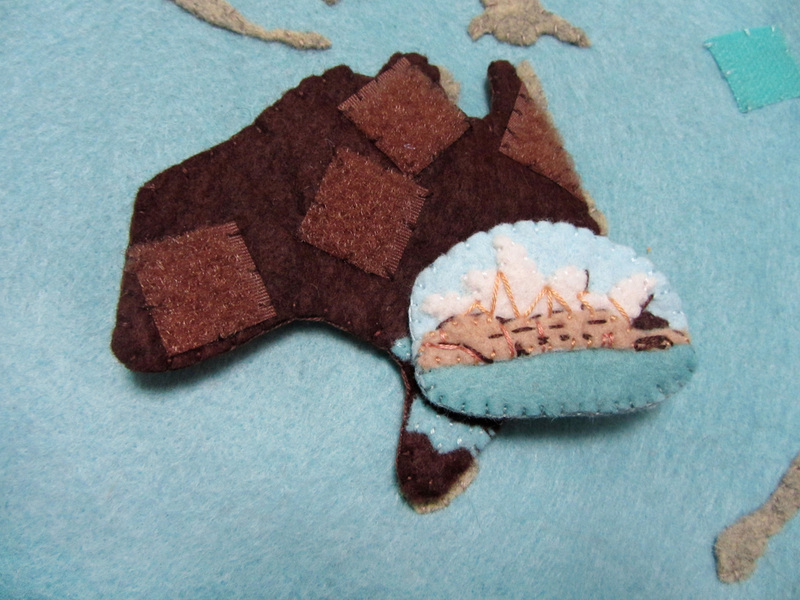 For all the landmarks, I started by sewing the front piece. Then I cut out a backing felt to match the final shape and added some snag-free Velcro to it. I finished sewed around the whole edge, switching colors where needed. 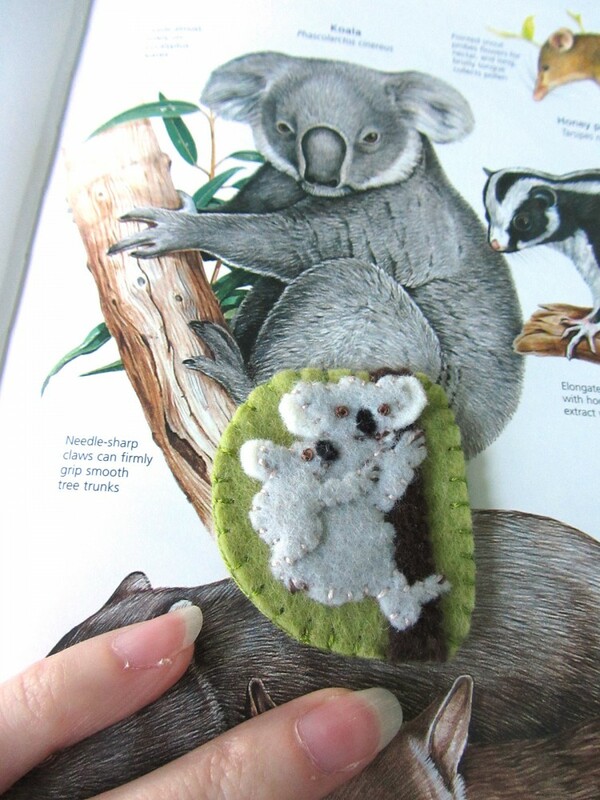 Did you notice I sewed the backing on? 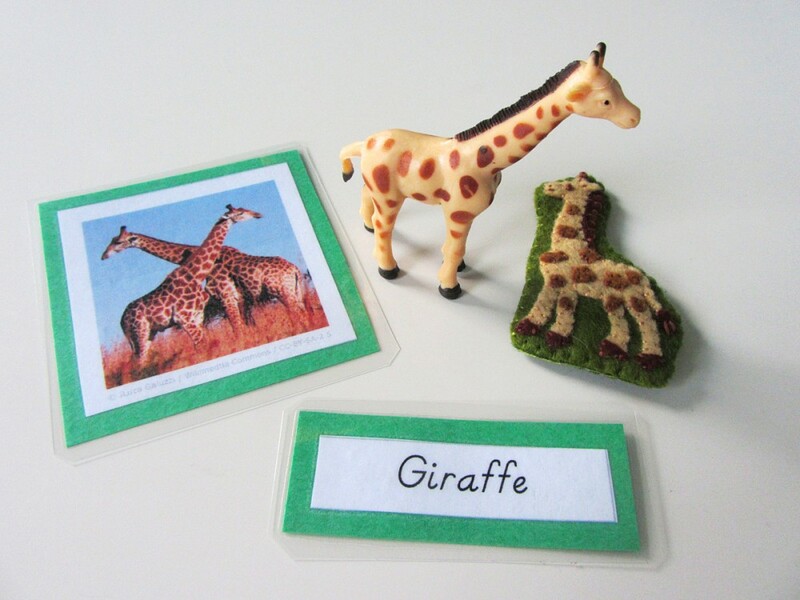 I used regular craft store polyester felt in black – the large piece that they sell in a package. It was only $3, and I figure I can turn it around and use the back as a felt board. I added two loops of ribbon for hanging. 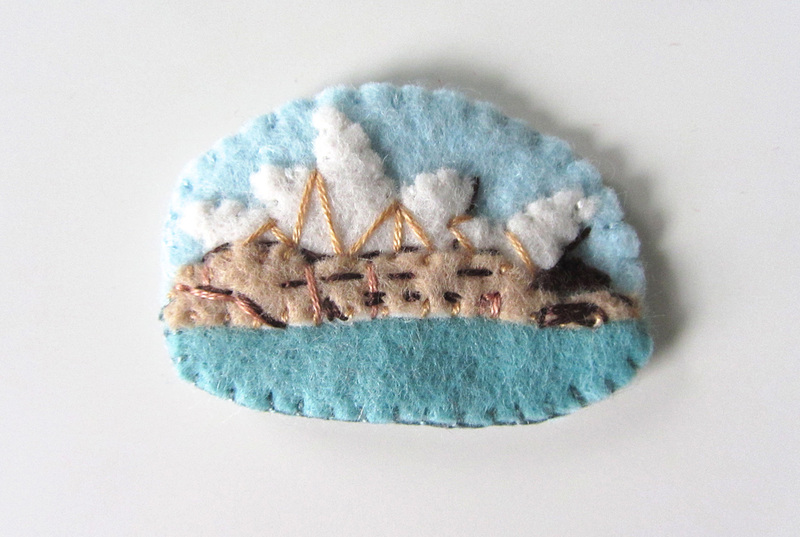 I sewed the backing on with a blanket stitch. 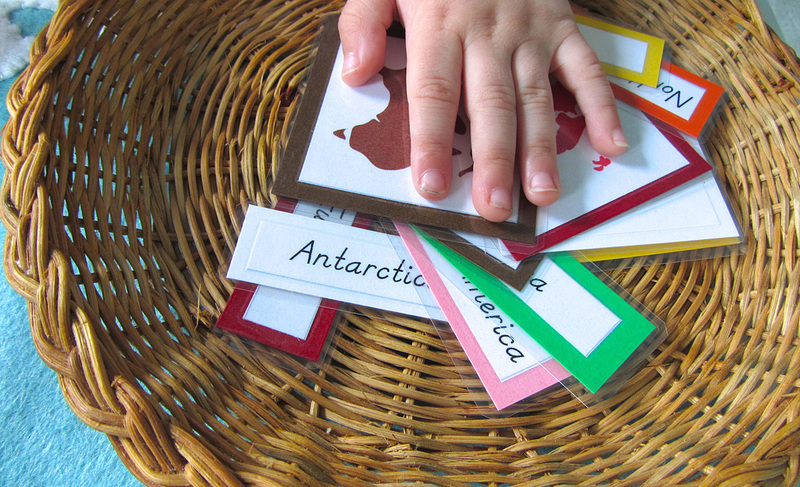 Montessori-style 3-part cards are great tools to help your young child learn new things. Jax loves them! 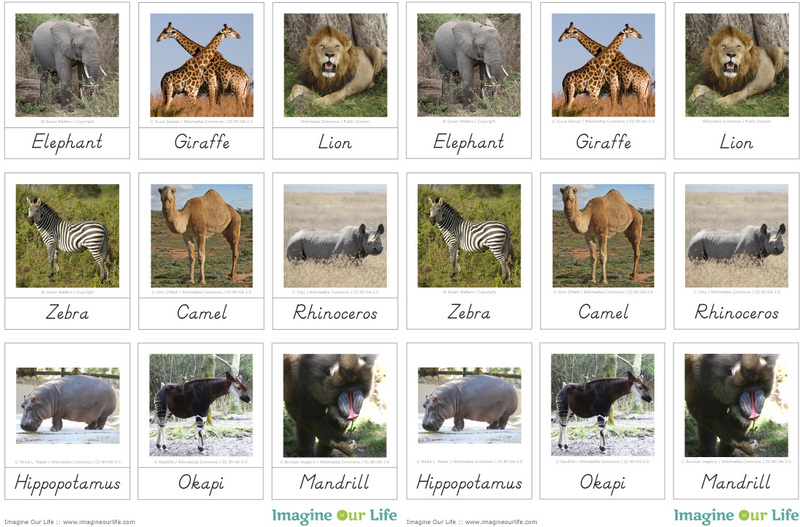 I like to pair them with nature video clips from BBC and NatGeo that I play on YouTube about each animal. 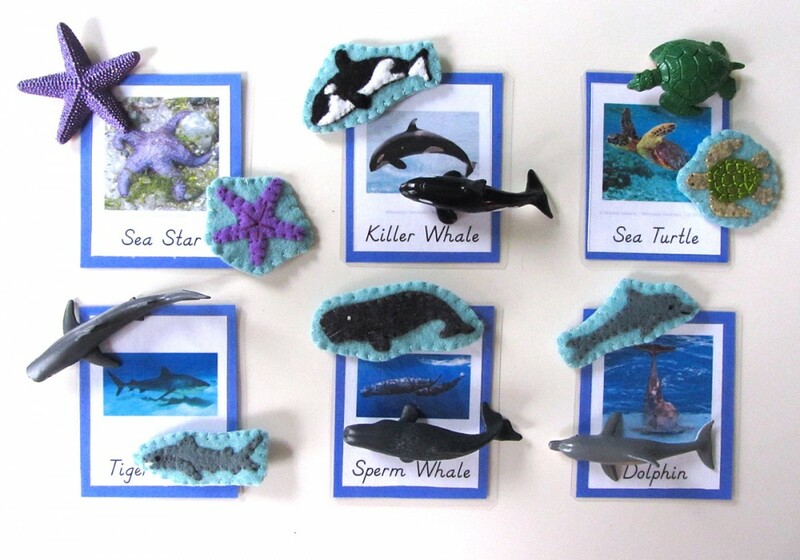 I created these ocean animal cards to be used along with SafariLTD’s TOOB figurines and my felt wall map animals. 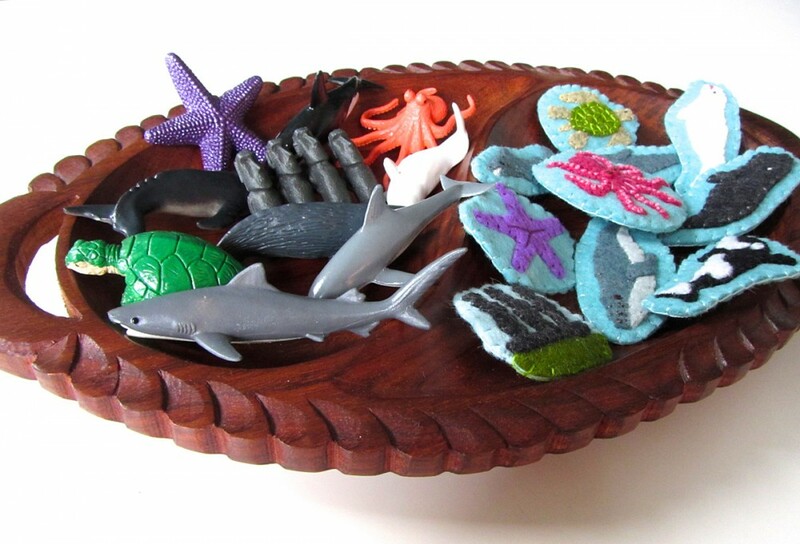 For the ocean, I used the following TOOBs: the Whales and Dolphins Toob and the Ocean Toob . 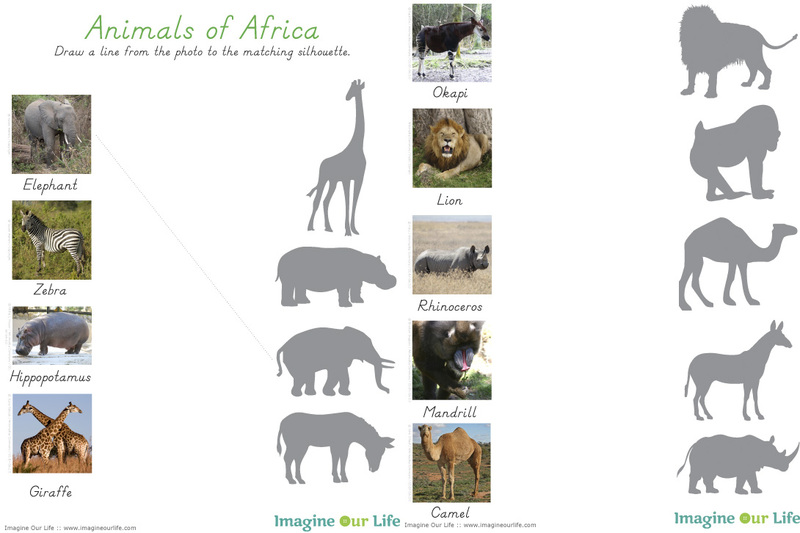 Click here to download my free pdf file to make your own. 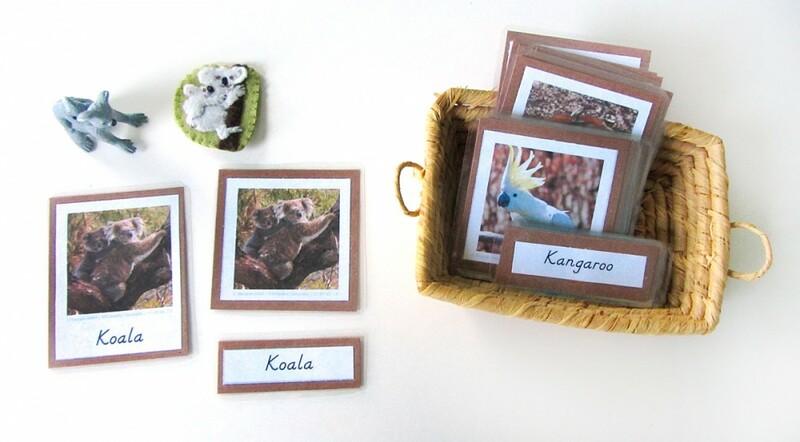 To make mine, I cut them out, glued them to orange construction paper (to match North America’s Montessori color) then laminated laminated them. It makes them shiny and strong. 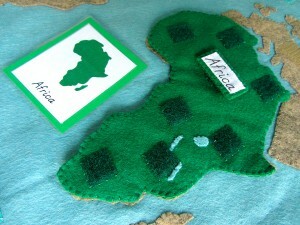 Jax just started his world continent unit with the world continent 3-part cards I made up for him. He loves his new Montessori globe, and has his continent song memorized! 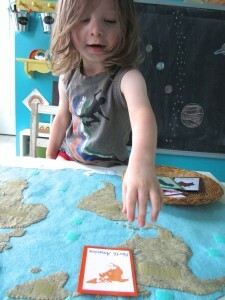 This ocean set may be a bit advanced for him right now, but who knows – he is always surprising me! 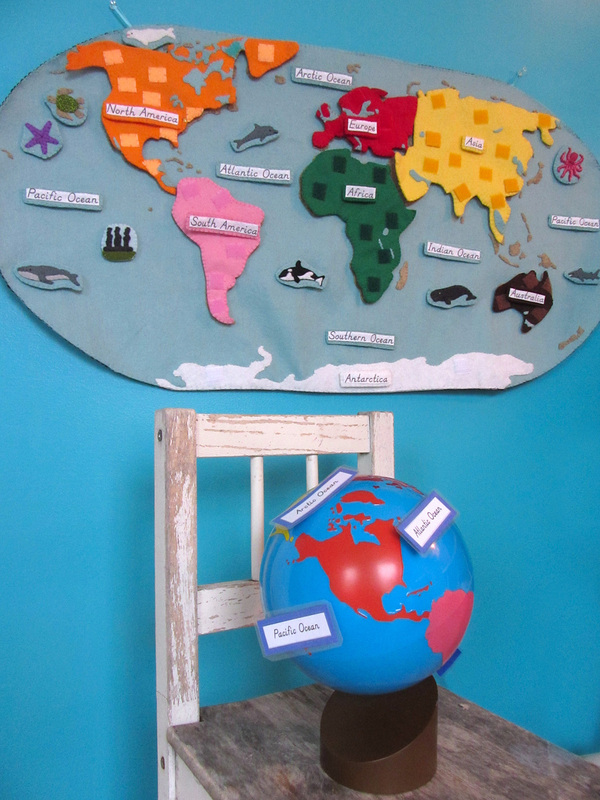 Montessori circles back through material, diving deeper into it each time, so it never hurts to introduce something when your child show interest. For younger kids, you can have them match the labels to the labels on the control map to help early reading skills. Talk about how the continents look on the cards versus the globe and control chart map projection. For older kids, try a little painter’s tape on the backs of the labels and have them use the control chart to label your globe. 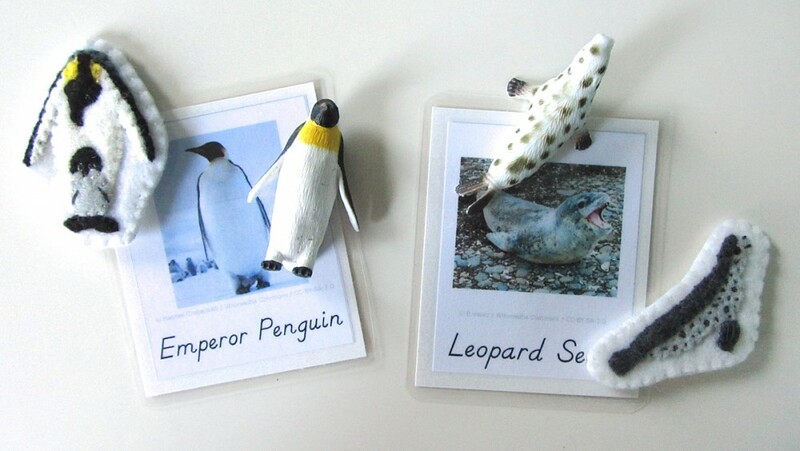 Once your child is familiar with the labeled cards and chart, have them start matching the unlabeled cards as well. 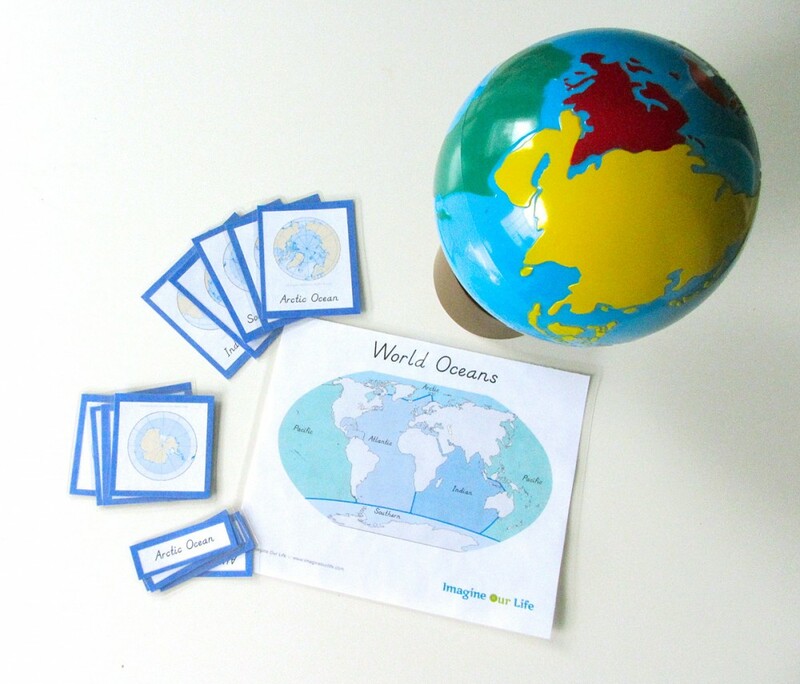 Eventually you can have them label the cards and the globe on their own. 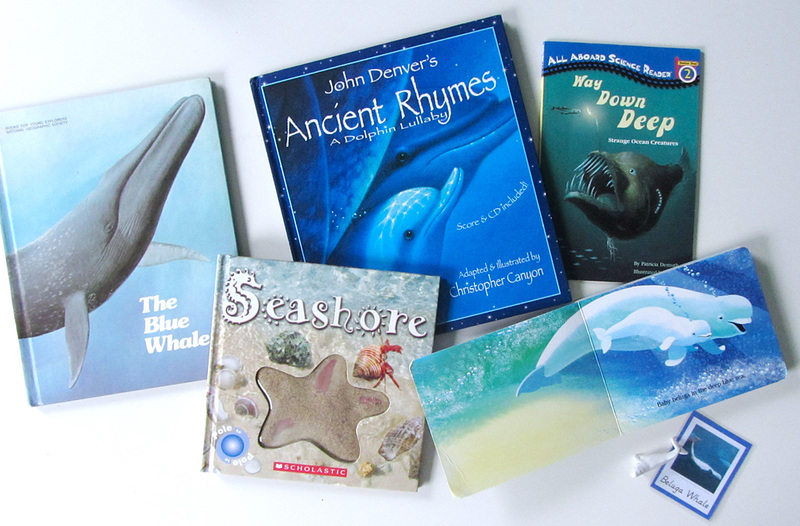 I’ve started collecting some ocean books, so when Jax chooses one in the schoolroom, I can pull out our SafariLTD figurines and 3-part cards to match them. Most of my books are from the thrift store and out of print. These are The Blue Whale , Seashore , John Denver’s Ancient Rhymes: A Dolphin Lullaby (Audio CD Included) (John Denver & Kids Series) , Way Down Deep (All Aboard Science Reader) and Baby Beluga (Raffi Songs to Read) . I hope you are enjoying this project as much as I am! 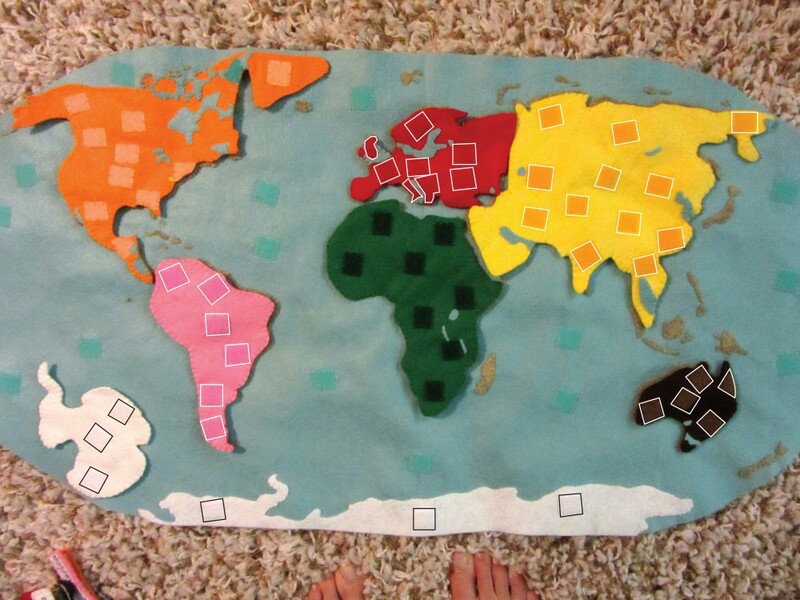 I’ve gotten see the maps a few of you have started! If you are sewing along, tag me on Instagram @iolstephanie and come comment on one of my pictures (I can’t see your photo if it you are private, but I can request to follow you temporarily if you comment on mine) or share photos on Facebook. You can also email me. 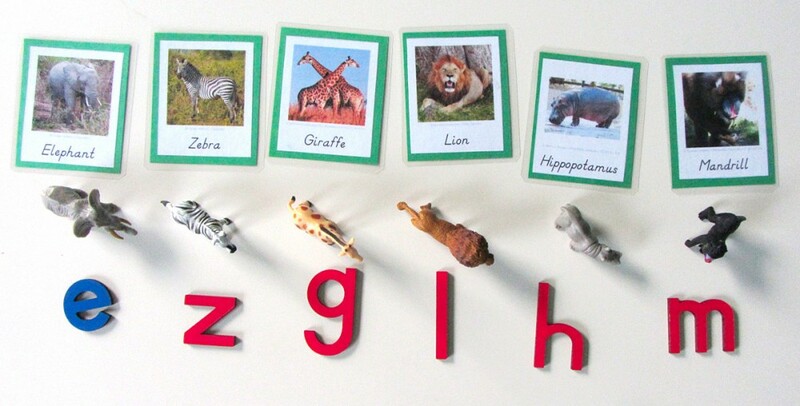 It’s Montessori Monday on Tuesday for me this week, but I hope you’ll check out the other great links! 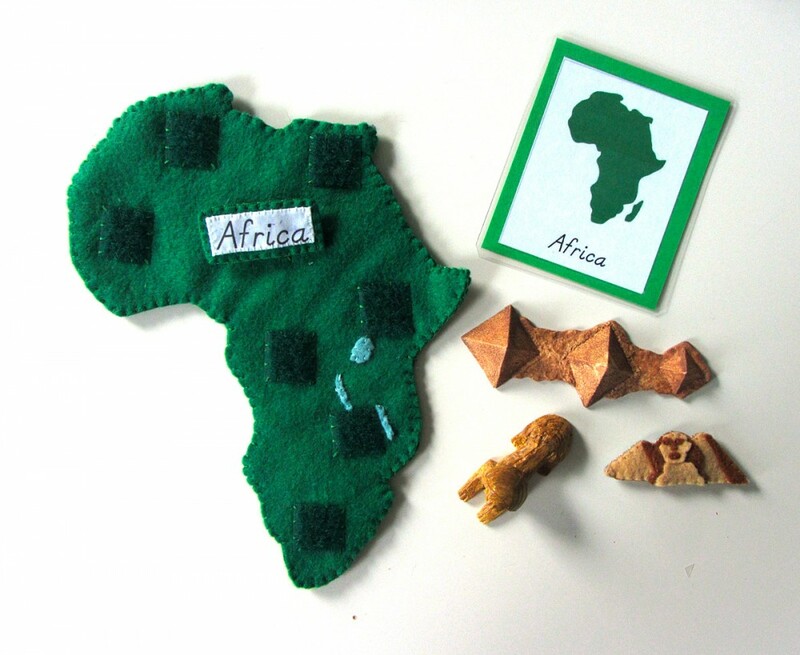 This entry was posted in Crafts, Homeschool, Montessori, Quiet Book, Sewing and tagged Continents, Free, Homeschool, Montessori, Ocean, Patterns, Printables, Quiet Book on August 6, 2013 by Stephanie. I am so excited to introduce you to make latest big project! Those of you who follow along on Facebook or Instagram have already seen a lot of fun sneak peeks. 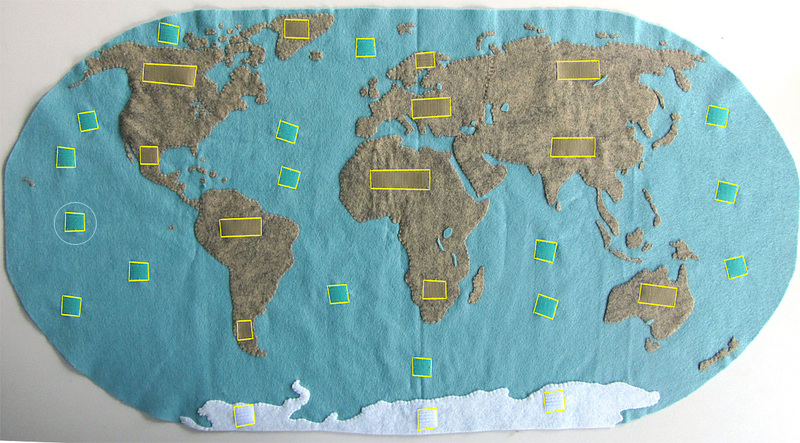 Plus, it was YOU who voted on the Facebook page to make a world map the next quietbook project! This project will be presented a little different than normal. Because it is SO BIG, I’ll be giving you a chance to sew along with me by posting a great deal of the patterns today. I am creating each piece by hand and then drawing up patterns from the finished product, so some elements will be provided in later posts. 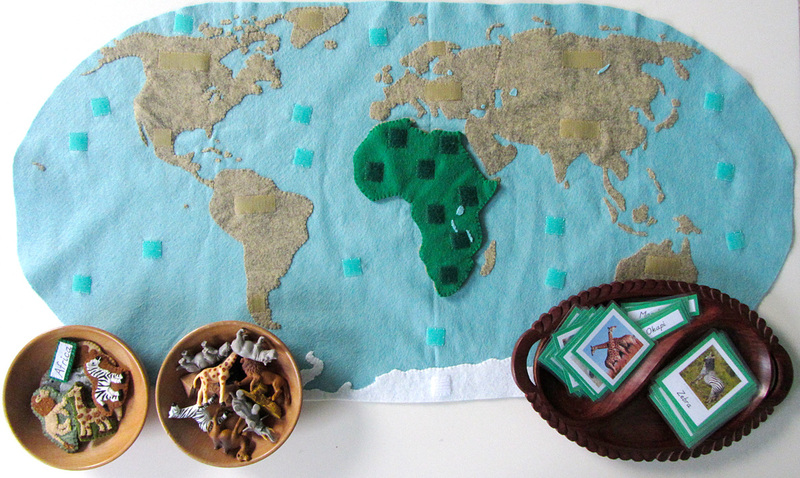 Today I am giving you the massive pattern for the world wall map and the continent puzzle pieces that can be attached to it. 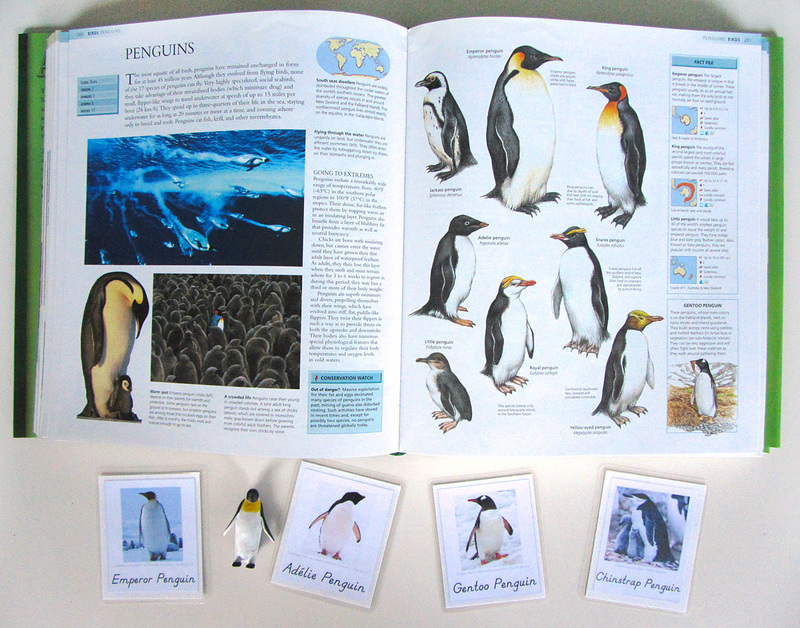 I also included the cover text for quietbook stores all the pieces. Here is pattern. [The pattern was updated 07/24/13 to add the water beside Baja California on North America. Sorry I forgot it!] 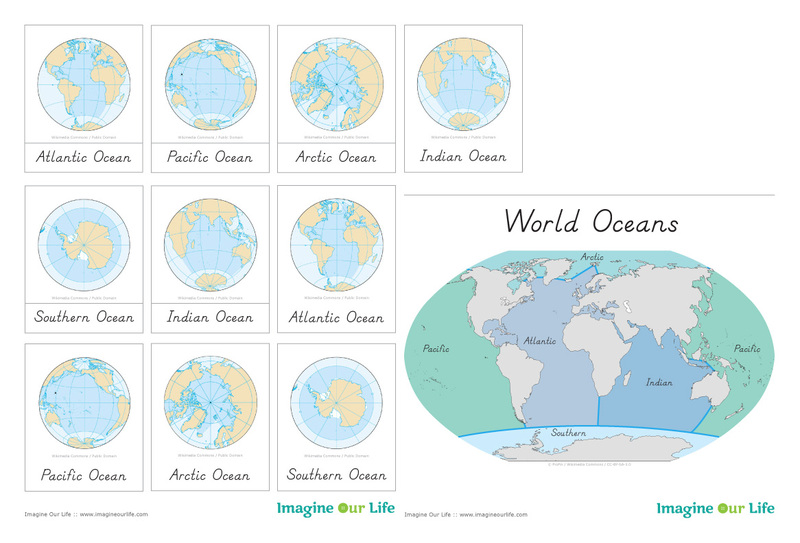 And here is a pdf with the continent and ocean labels that get printed onto printer fabric . 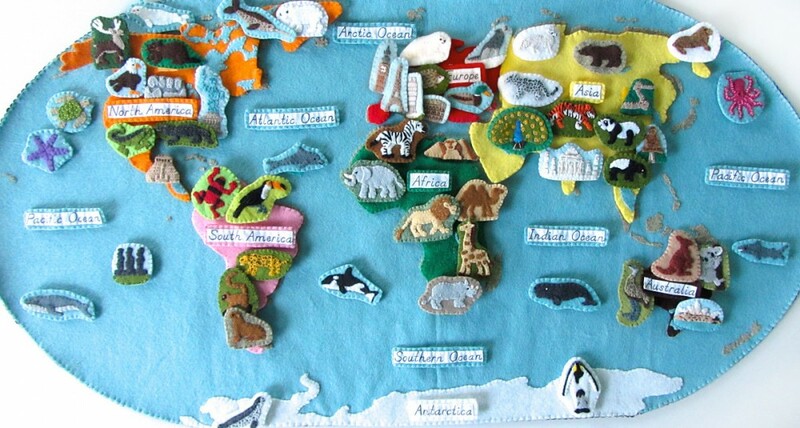 There will be additional posts for the other continents that will include patterns for regional animals and landmarks. 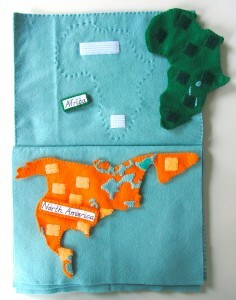 Felt: I am mainly using scrap felt to create the continents and smaller pieces of this project. 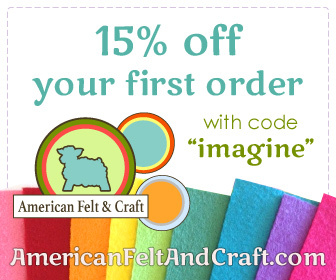 The beautiful wool blend felt I get from American Felt and Crafts is just too good to waste! So I am digging into my scrap basket and using all I can. 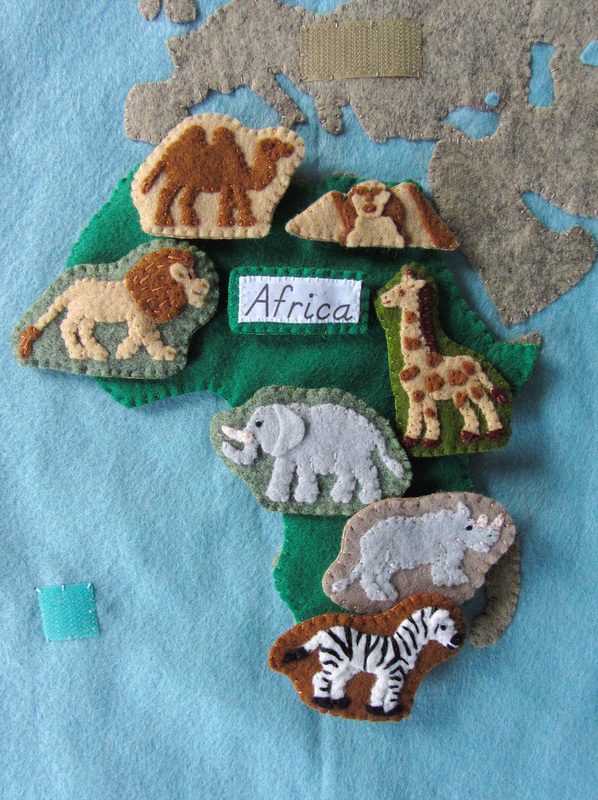 However, this project does require some larger cuts of felt. 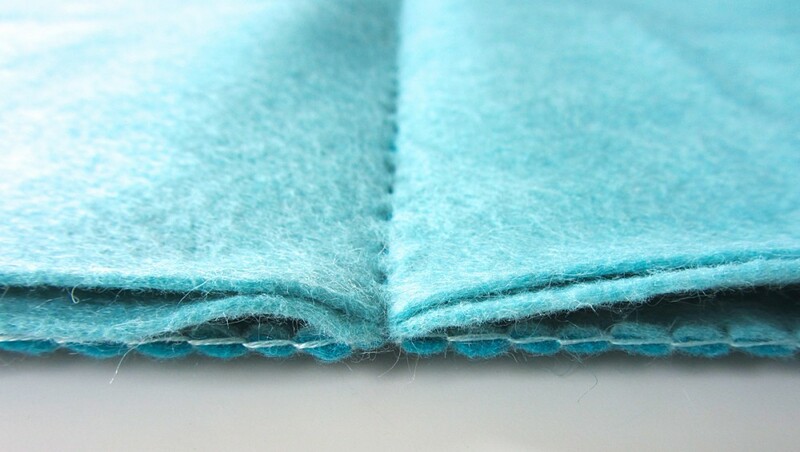 I ordered 1 yard of “Swan” blue felt from Benzie Designs. 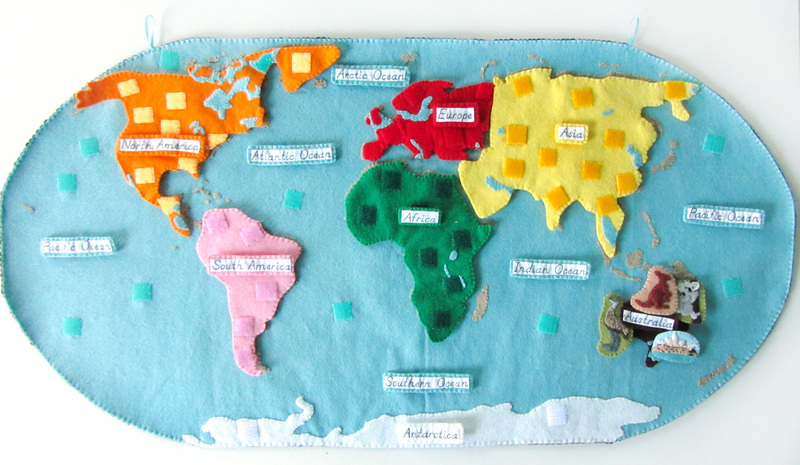 This was used to make the 34″ x 18″ wall map and then three 12″ x 18″ pages for the quietbook. 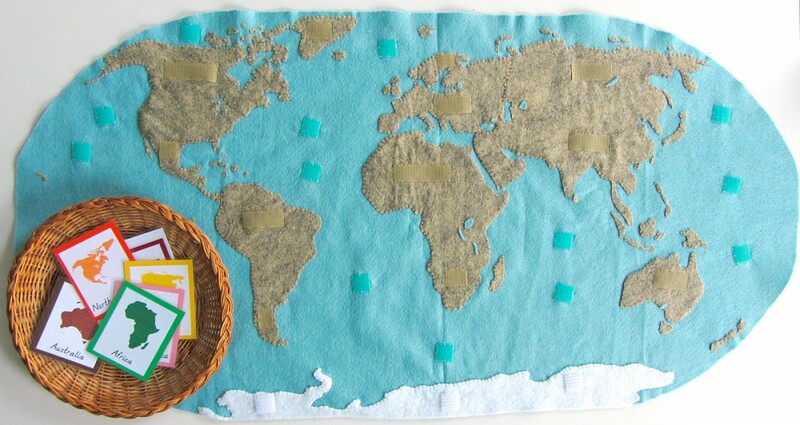 I also ordered a 12″ x 18″ sheet of “Peacock” aqua blue felt for the cover, 2/3 yard of white (you only need enough for the long strip version of Antarctica, but I bough extra for other projects) and 1/3 yard of “Peppercorn” tan for the wall map continents. 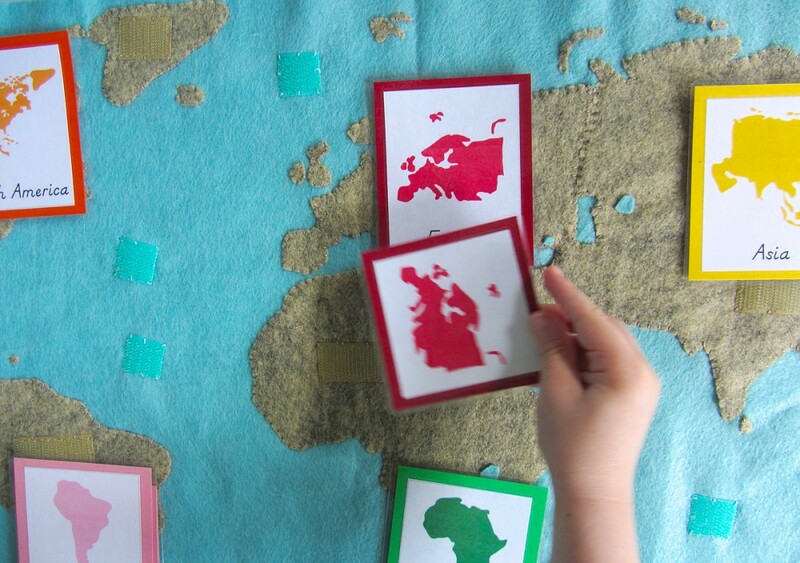 The continents are in traditional Montessori colors including: white, orange, pink, red, green, yellow and brown. 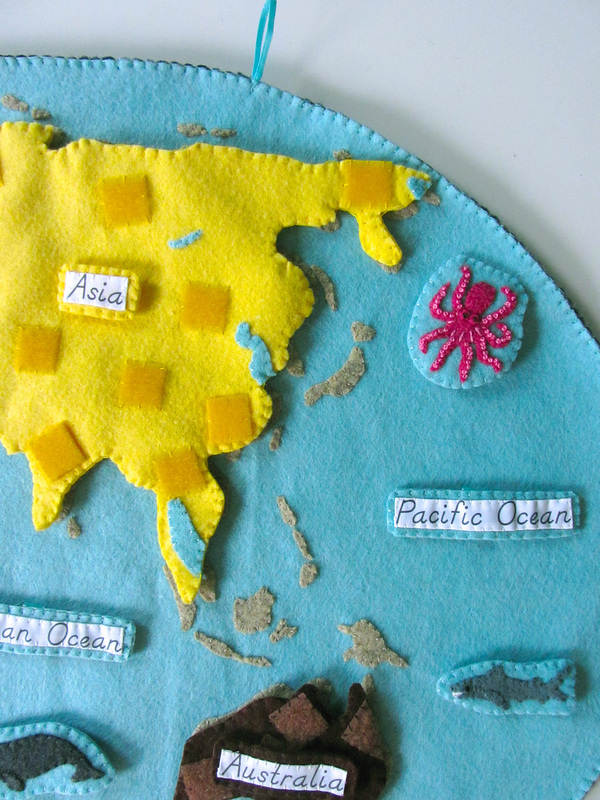 I will eventually buy some backing felt or fleece for the back of the map to finish it off, but I have a few little bits to finish sewing first. 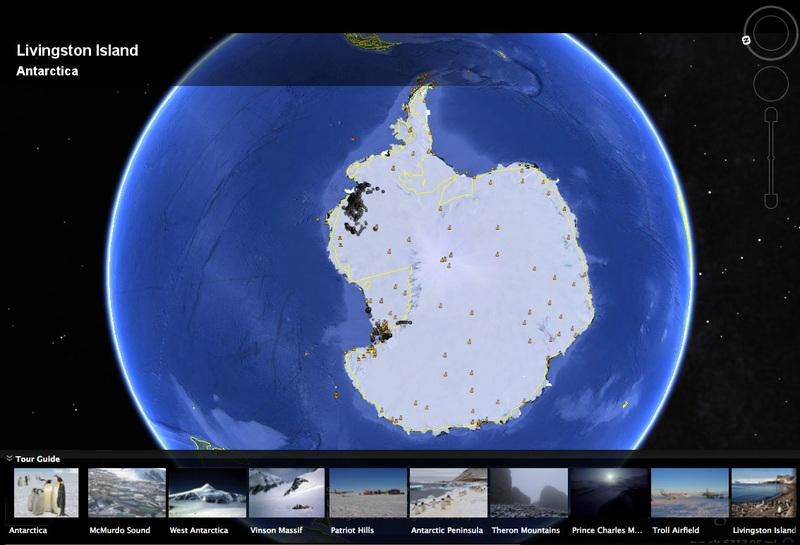 Note – Antarctica is sewn down to the wall map due to the map projection. 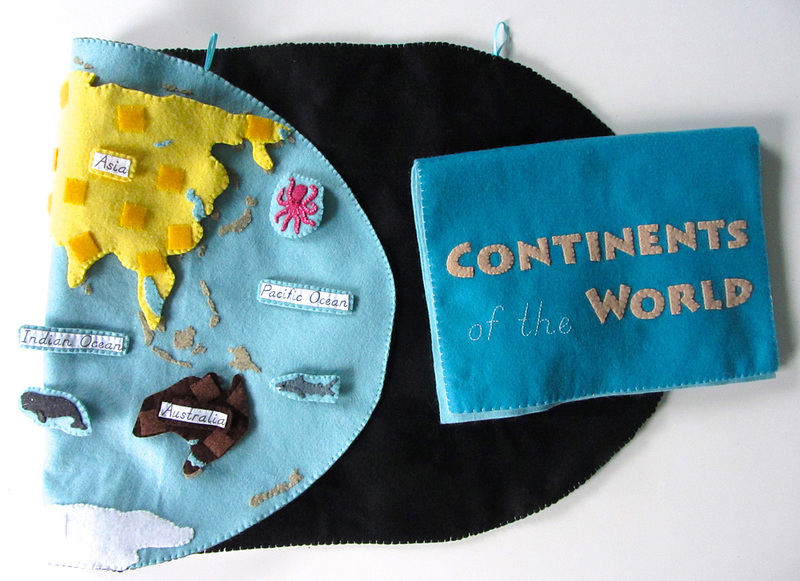 But I did also make a continent piece in its actual shape. 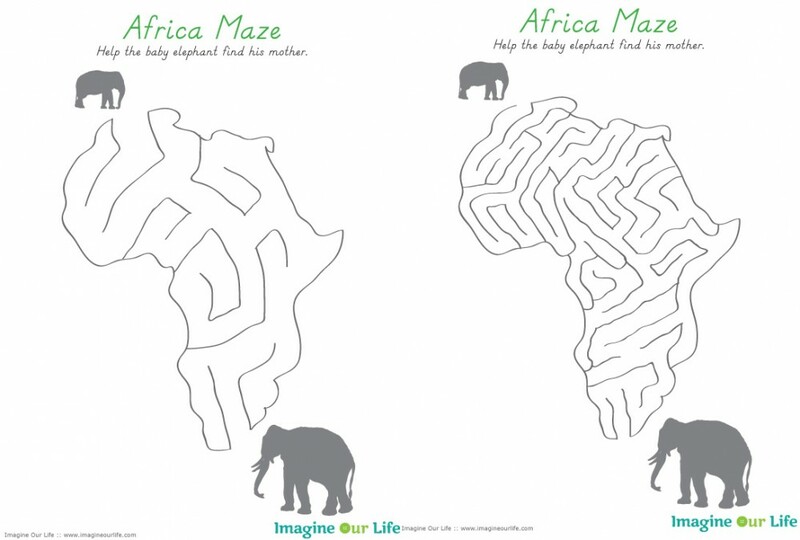 You just can’t place it on the map. Other: If you plan to print out the continent and ocean labels, you’ll need printer fabric . I use a roll that I can cut down to use in my 4″ x 6″ photo printer when I just have a little bit to print. I’ve also seen sheets for sale. For the pockets in the back of the book, you’ll need clear vinyl. I get mine in the home decor department of the fabric store. I am using felt glue this time around to lightly tack down small felt bits before sewing them. It is working out great! I have that exact kind, but found a better price in the craft store. 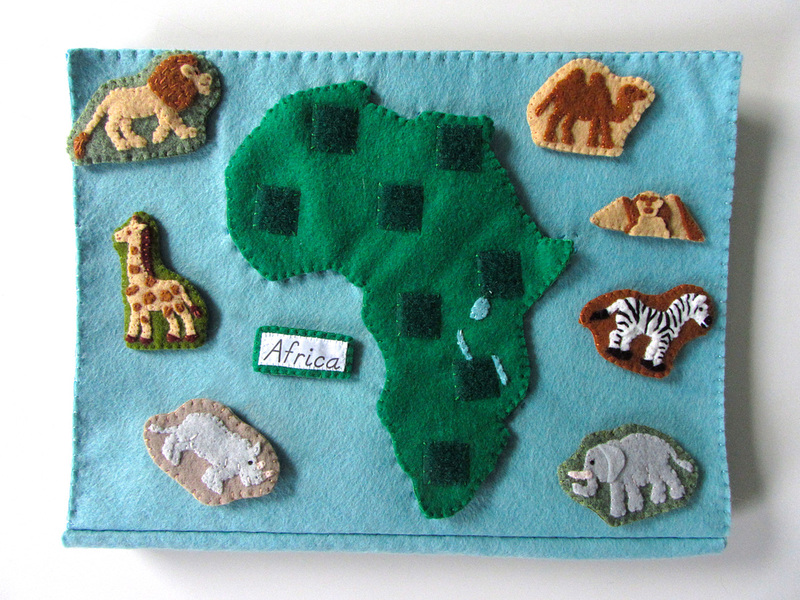 I will be adding some closures to the quietbook – two buttons and some elastic cord loops. I’m still looking for the right ones. The big thing you need… hook and loop! I use snag-free Velcro inside the quietbook and on backs of all the loose pieces. 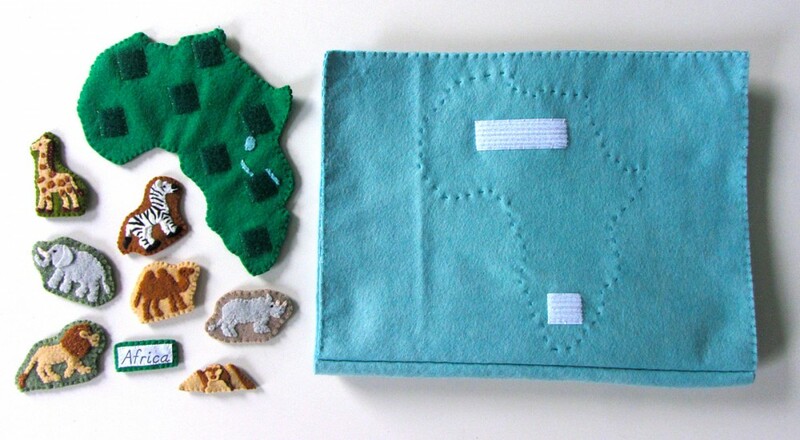 It won’t fuzz up your felt when you close the book or store the pieces together. I also use a lot of colored hook and loop. 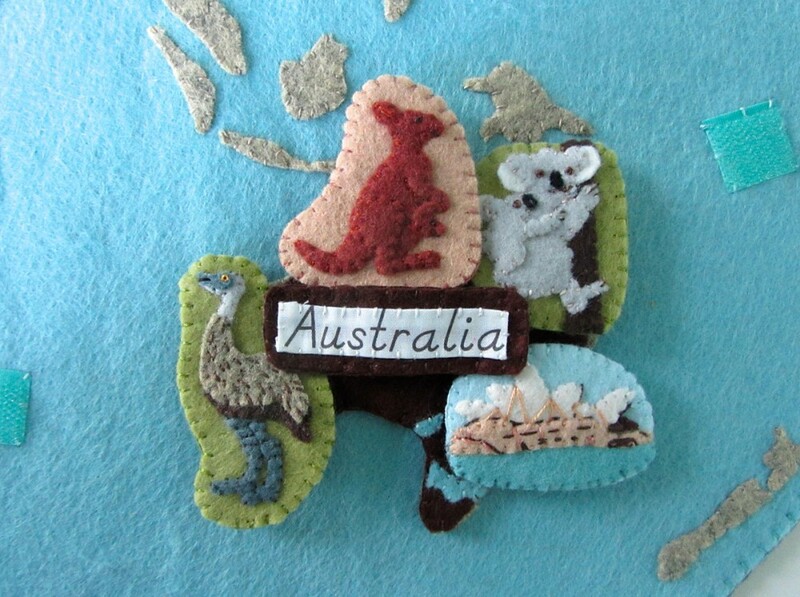 I use the soft loop side on the fronts of the continents (for the animals and landmarks to stick to). For a stronger hold on the wall map, I used the hook side. This means I will have to put some tissue paper over it if I ever roll or fold it for storage to avoid fuzzing up the felt. I got this turquoise hook and loop for the ocean. The tan Velcro is sold with black and white Velcro in the store. All the novelty colors are available from AFC. I didn’t have the best match in orange, but I am using pieces from my stash. This piece is not yet finished (it needs a backing and loops at the top), but it is almost there! To make it, cut out all the large pieces and arrange them on the blue backing. 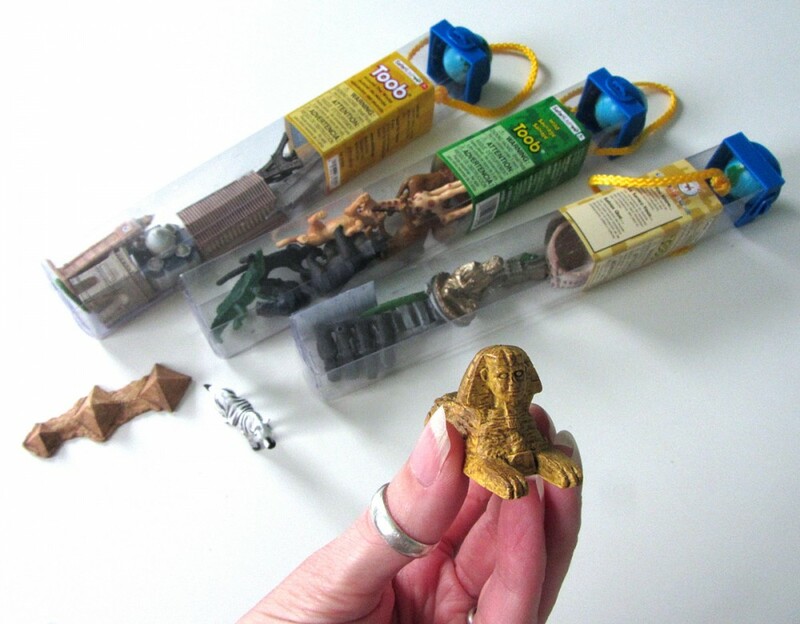 Use a thin layer of glue to tack them down. Too much glue will make it tougher to sew through. 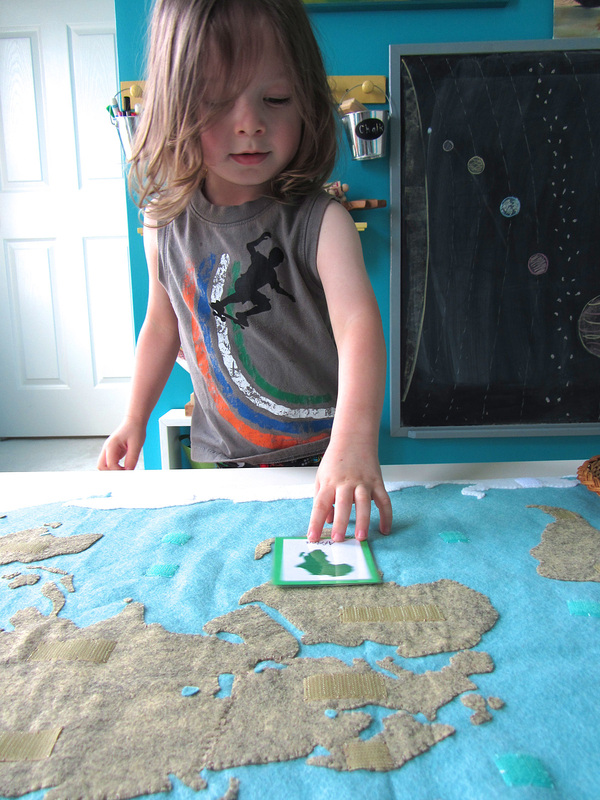 Then cut out the zillion little islands and glue them down as well. I cut mine free-hand. 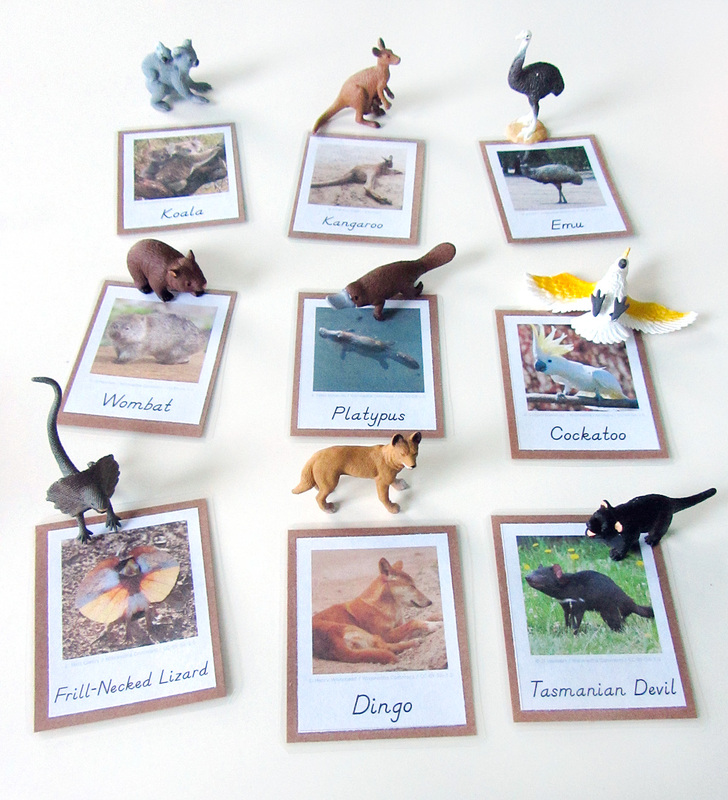 I didn’t feel like it had to be super accurate at that scale – the overall effect when they are all in place is good enough! 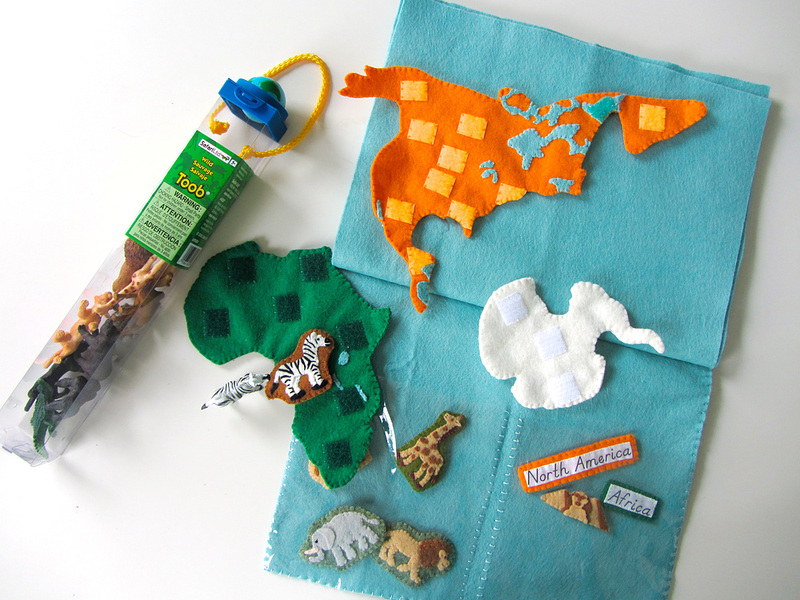 Once everything is glued down and dry, sew around all the edges. I used “Dual Duty Button & Carpet” thread in tan. Worked great! 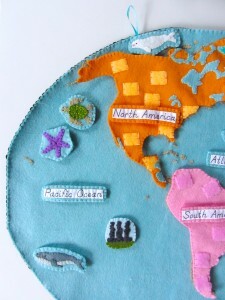 After that, sew strips of hook and loop on to the map where indicated in the above photo. 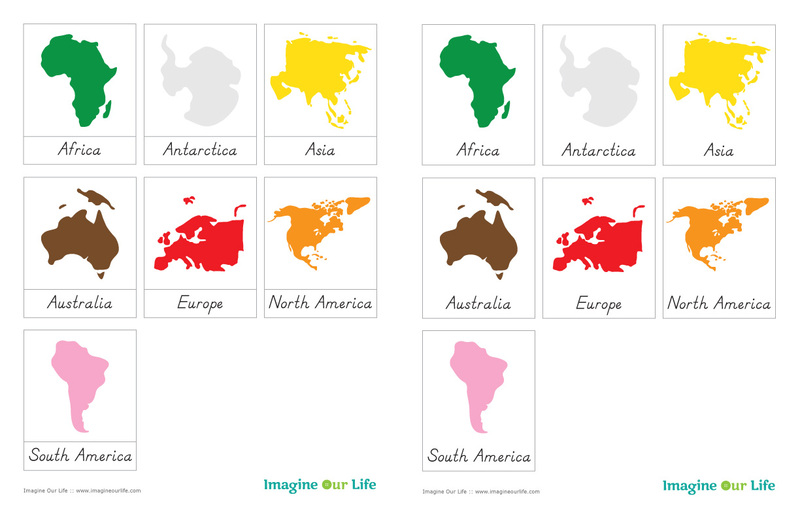 The ocean ones are for sea animals, the land ones are to hold the continents. I will eventually sew a backing on with some hang loops at the top. I have started this, but it is only about half done. To start the book, I stacked the 12″ x 18″ sheets with the cover piece on top, then sewed a dashed running stitch through the center. 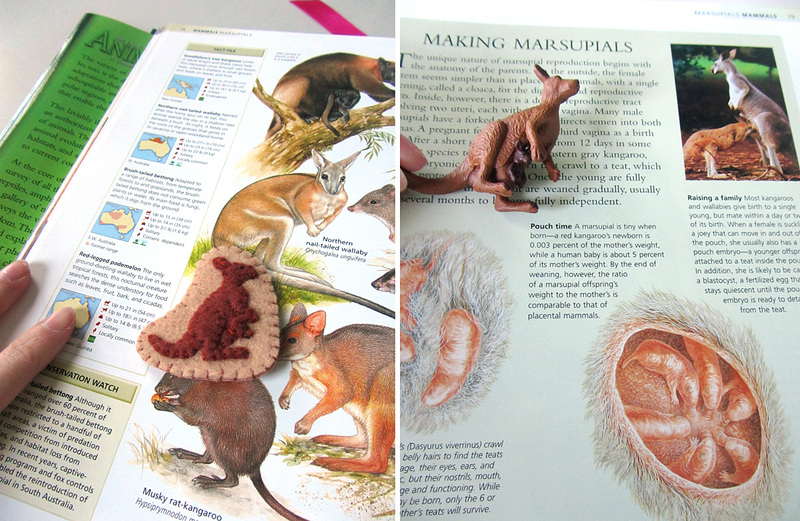 I then folded along the stitching to make the book. 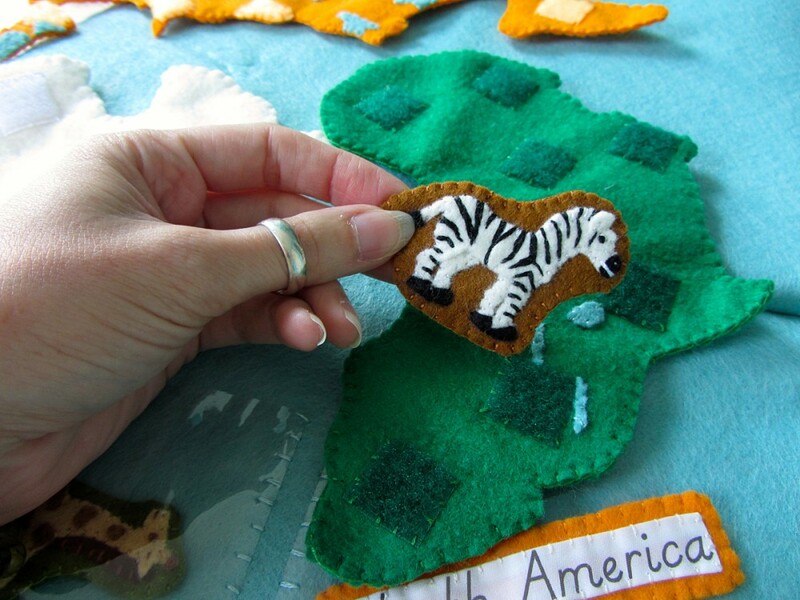 Once the sewing is done, each page is made by sewing two layers together. I have the first and last (cover) pages done in these photos. 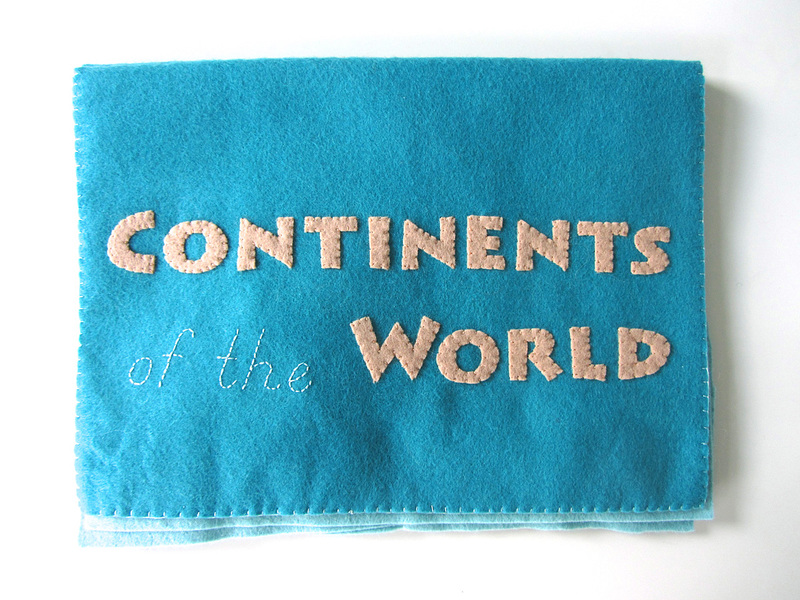 I will go into more detail later, but the cover has the title letters sew on (“of the” is back stitched), and the last inside page has two clear vinyl pockets sewn on – one for animals of the world and one for labels and landmarks. The pages will be sewn with dotted outlines and snag-free Velcro so you can match and store the continents. Some pages will have more than one continent, as shown. 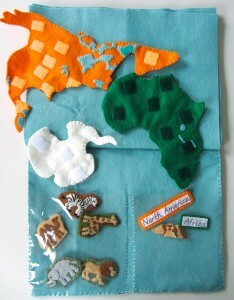 I came back to this post after finishing the continent pieces so I could share the final positions of the loop Velcro. 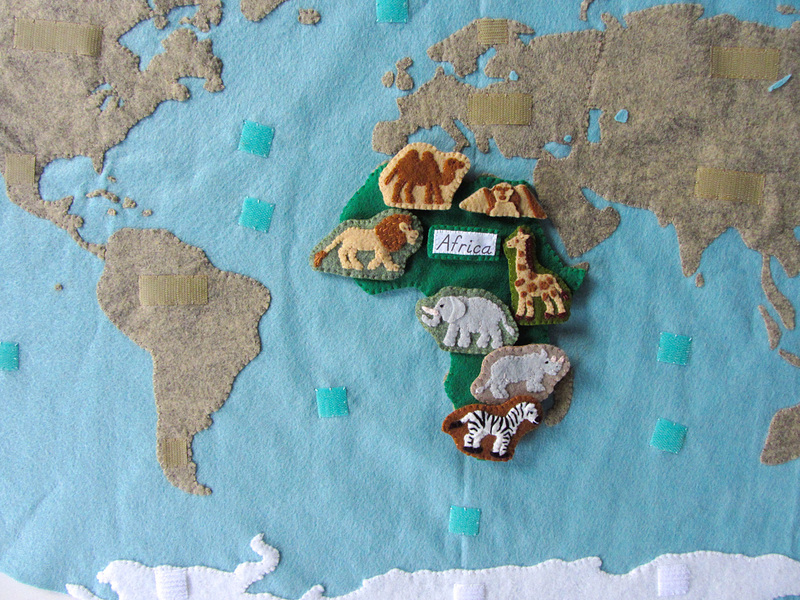 Africa’s and North America’s are already posted in their patterns. See the rest above. 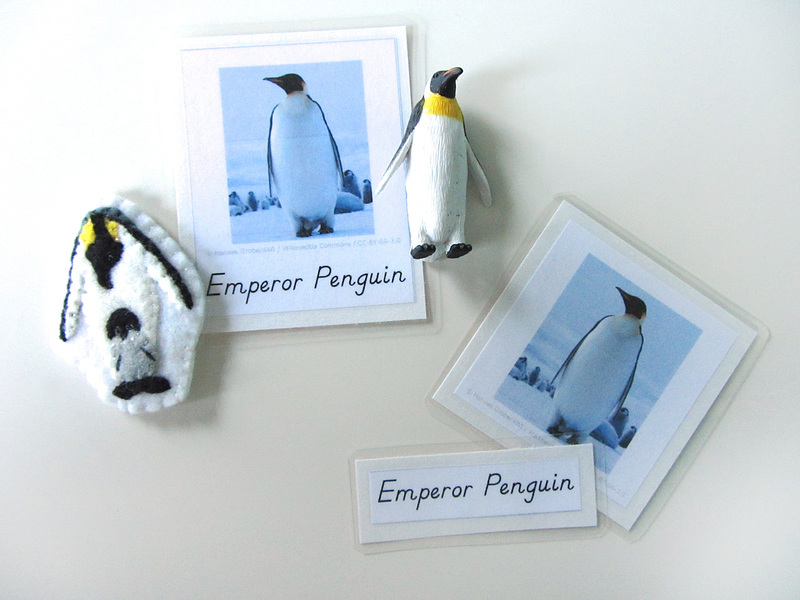 Jax just started his world continent unit with these 3-Part cards I made up for him. 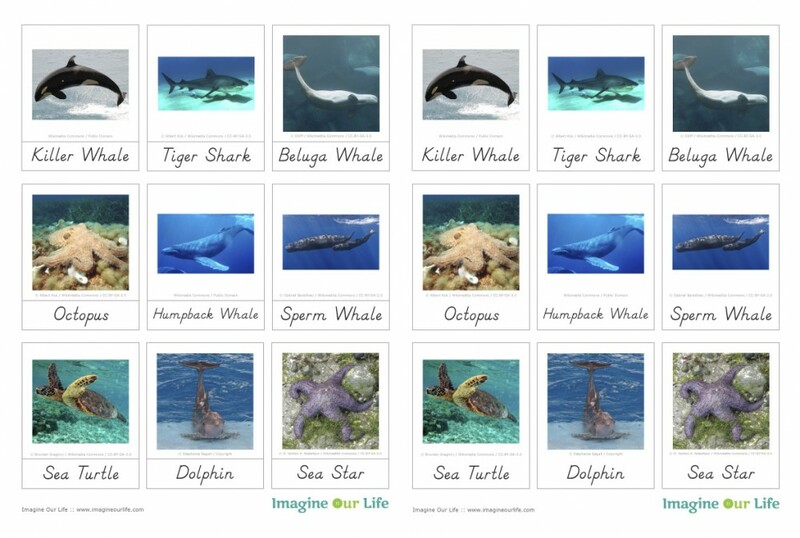 Click here to download my free pdf file to make your own. 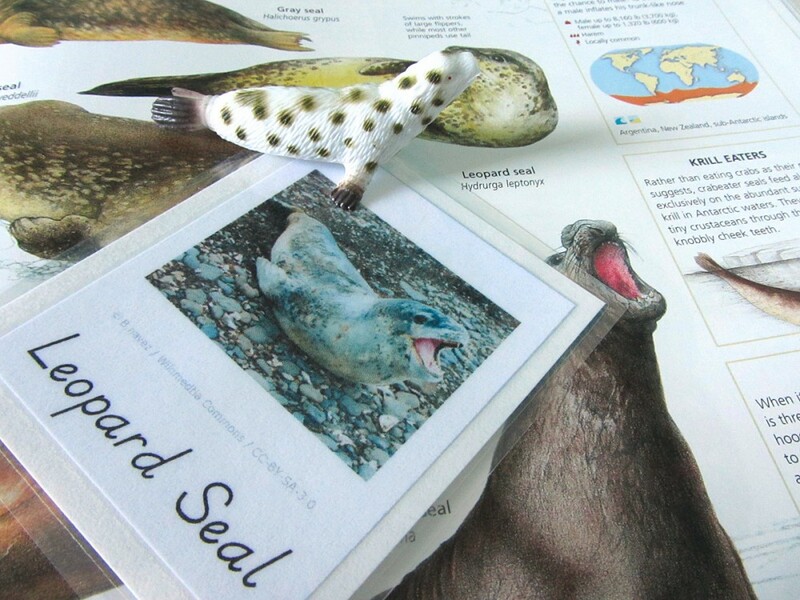 To make min, I cut them out, glued them to card stock then laminated them. 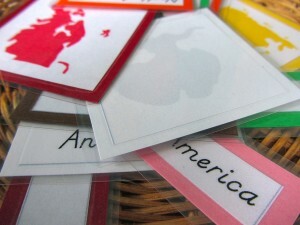 I’m loving my new laminator ! 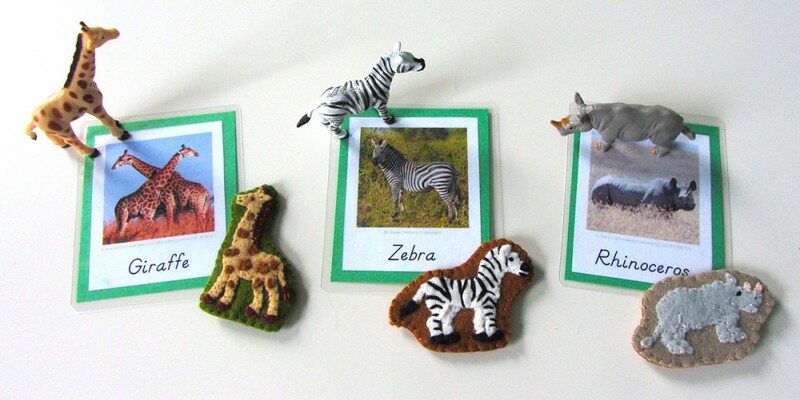 So far, I am presenting them to him to introduce the names and shapes, and we are matching them and finding them on the felt map. 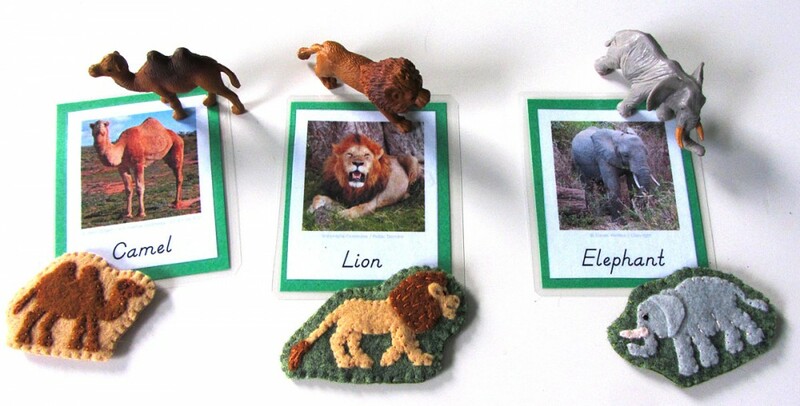 As he learns the names, he can start matching the labels to the pictures. 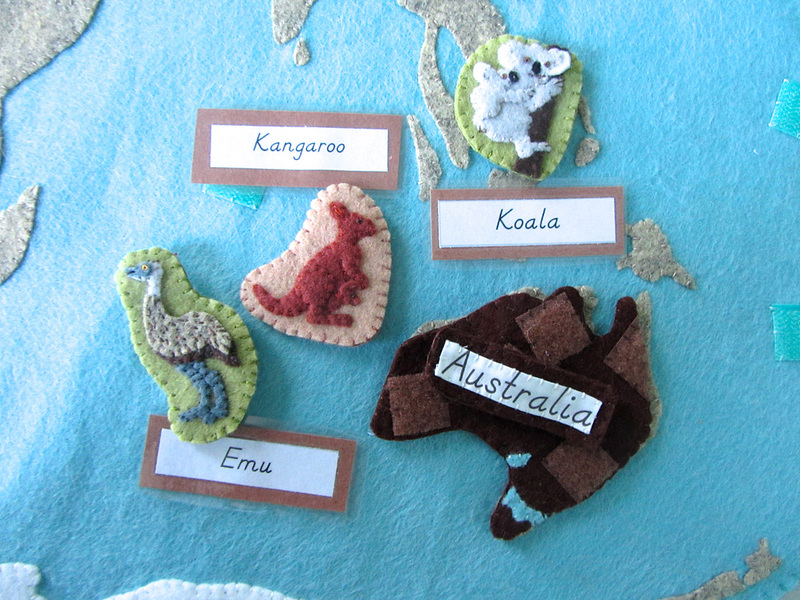 Once all the felt continents are done, we will use them with the cards as well. 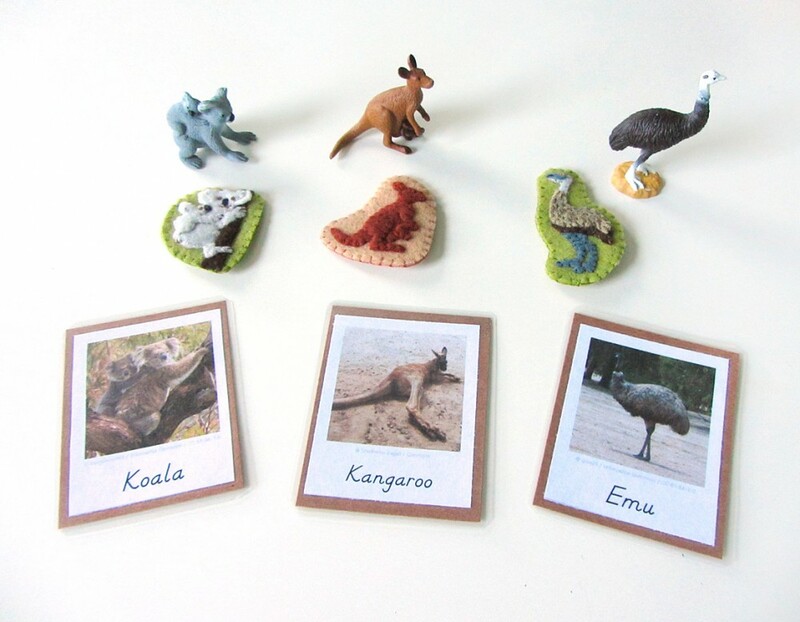 One of the most exciting parts of this project is still to come… I’ll be making little felt animals and world landmarks that can be placed on the continents and matched to the beautiful miniature replicas made by SafariLtd! I’ve been slowly collecting each TOOB I’ll need whenever I have 50% off coupons or store credit. 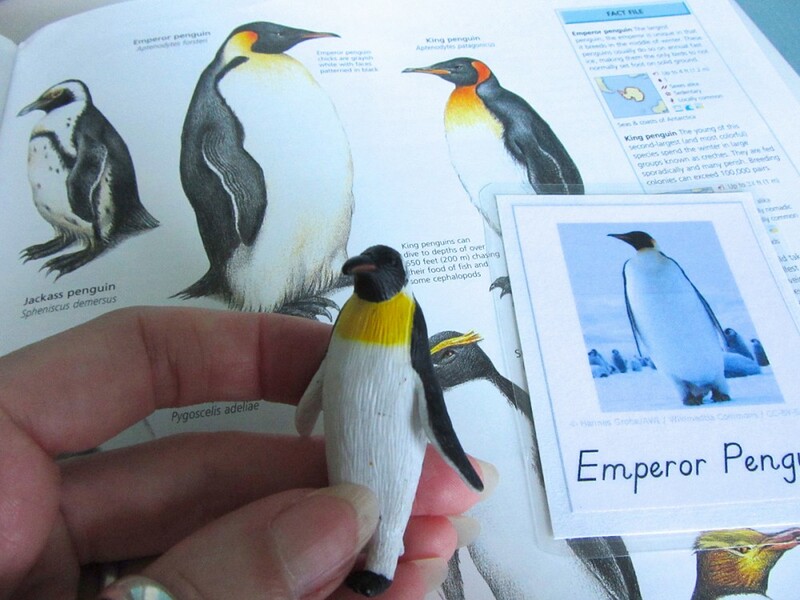 They are so neat that I want to play with them myself! 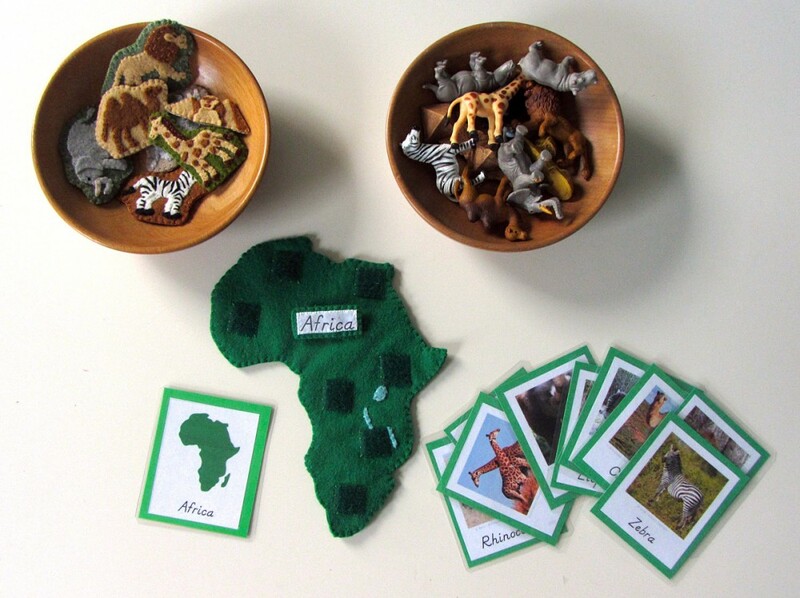 I’ll be working with SafariLtd to bring you a great giveaway at the end of this project, so stay tuned! I hope you’ll sew along with me! I am giving you these patterns totally free, despite the days of work going into them. 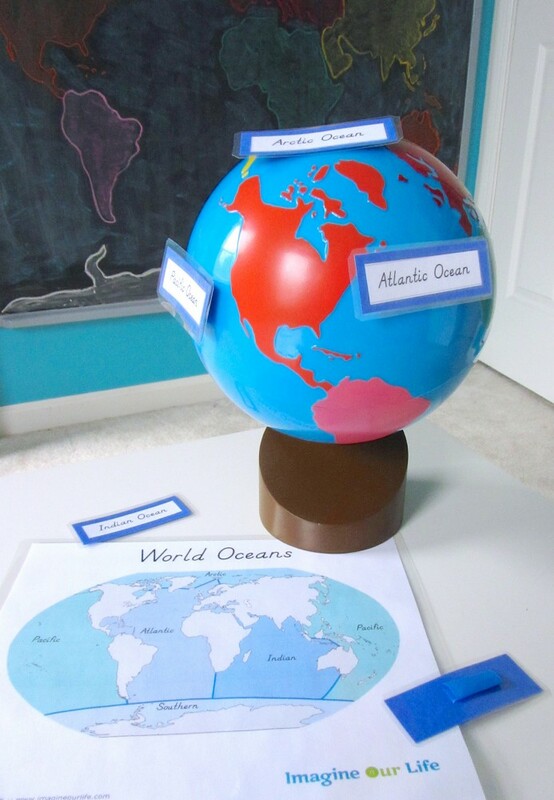 I think it will really help out teachers and homeschoolers alike! If you’d like to contribute in some way, you can read more here. 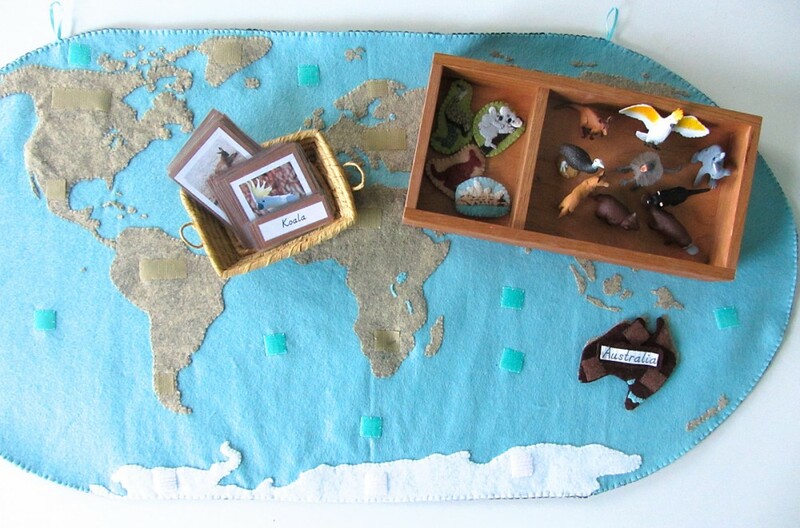 Also, Jax’s wishlist is where I add homeschool items I need to buy. One easy way to help? Share this project and Imagine Our Life with your friends! Thank you! This entry was posted in Crafts, Homeschool, Montessori, Quiet Book, Sewing and tagged Continents, Free, Homeschool, Montessori, Patterns, Printables, Quiet Book, Sewing on July 8, 2013 by Stephanie.